This time I used a mixture of Truvia and brown sugar. I figured with the chips I was going to add, a little less sugar would do us good. I made a ½ batch, based on the recipe on the back of the bag. The only thing from the full batch I kept was the 1 teaspoon of vanilla. 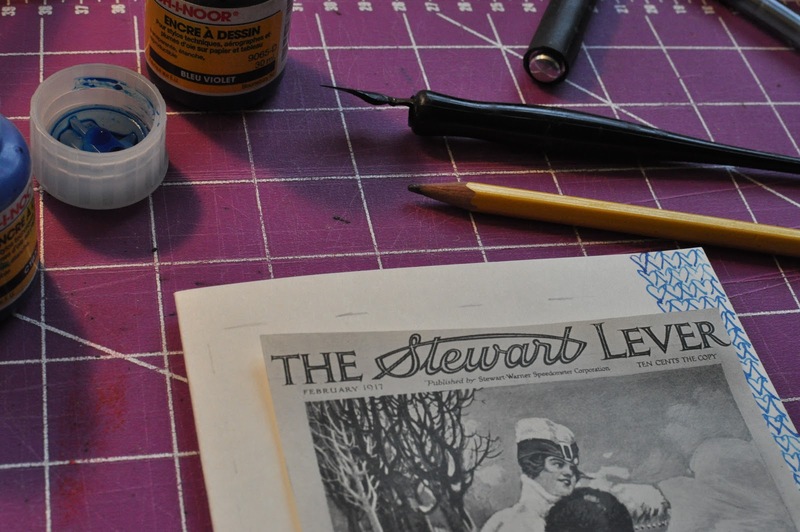 I write my notes on anything I can get my hands on – Smithsonian insert card anyone? 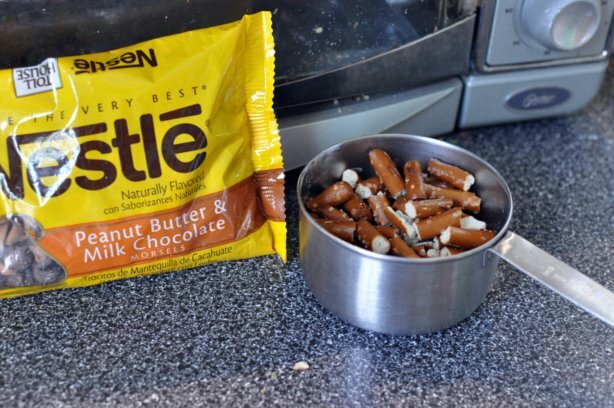 The amazing contrast in flavor and texture comes from the peanut butter & milk chocolate chips and the pretzel bites. Sweet & salty and chewy & crunchy all in one cookie – it’s the best of both worlds. Mix up the dough and chips, but hold off on the pretzels until just before baking – that way there is no chance of soggy pretzels. 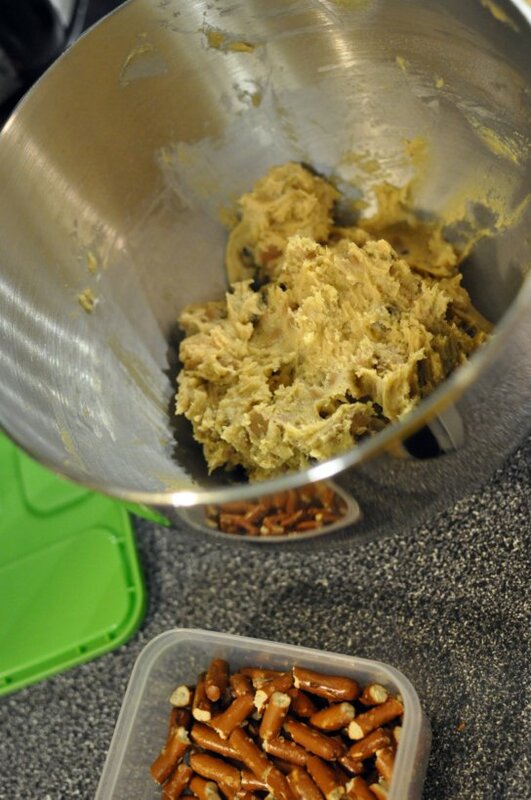 I always refrigerate my dough at least overnight – the cookies taste and bake better this way. Allow the dough to warm slightly before baking, but not enough for it to be really sticky to the touch. 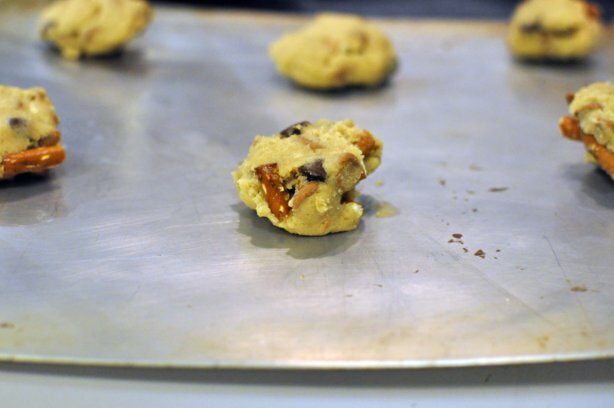 Use a dough scooper or spoon to create uniform cookie sizes. Then, add 5 to 6 pretzel bites and roll in hands, avoiding too much handling so as not to warm the dough too much. Bake at 350 degrees for 10 to 11 minutes, allow to cool on pan for 1 minute before removing. 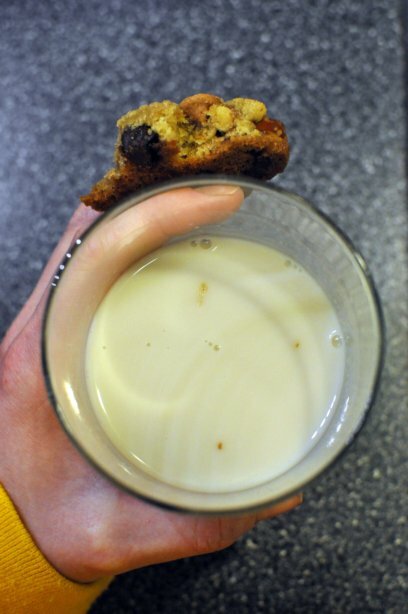 Enjoy with a glass of (almond) milk. Repeat. Make these and you will be someone’s best friend, mom, dad, spouse, partner, colleague, boss, or something. I promise. 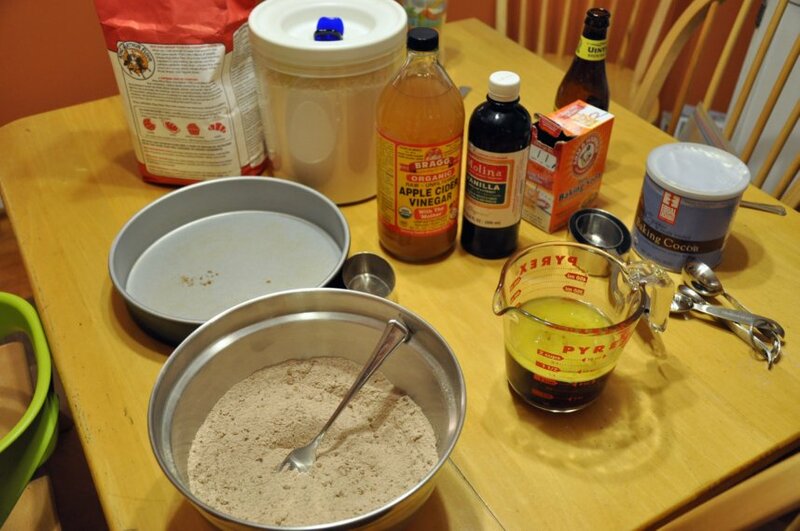 In a small bowl, combine 1-⅛ cups all-purpose flour and ½ teaspoon baking soda. 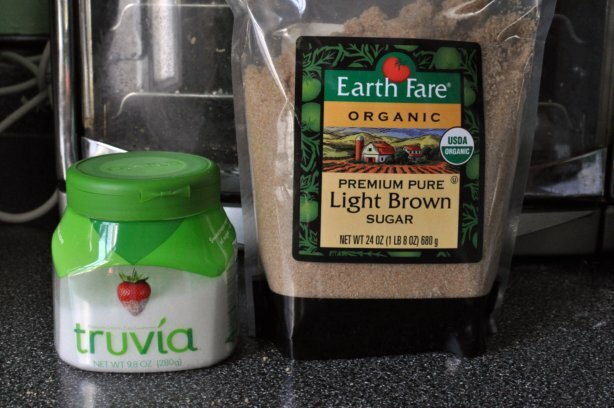 Beat ½ cup (1 stick) of butter, ⅜ cup granulated sugar (or Stevia), ⅜ cup packed brown sugar, and 1 teaspoon vanilla in a large mixer bowl until creamy. Add 1 large egg, mix well after addition. Gradually beat in flour mixture. 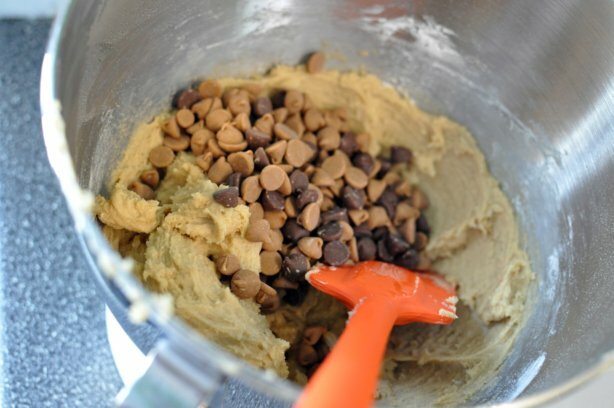 Mix in 1 cup of chocolate & peanut butter chips. Cover bowl of dough and refrigerate at least overnight*, but 36 hours is the optimal time. 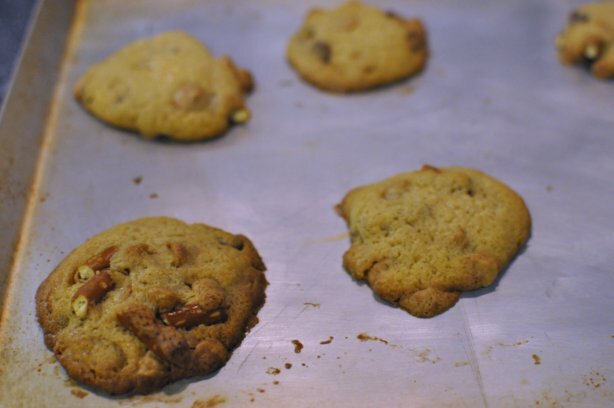 Use a dough scooper or spoon to create uniform cookie sizes. Then, add 5 to 6 pretzel bites and roll in hands, avoiding too much handling so as not to warm the dough too much. 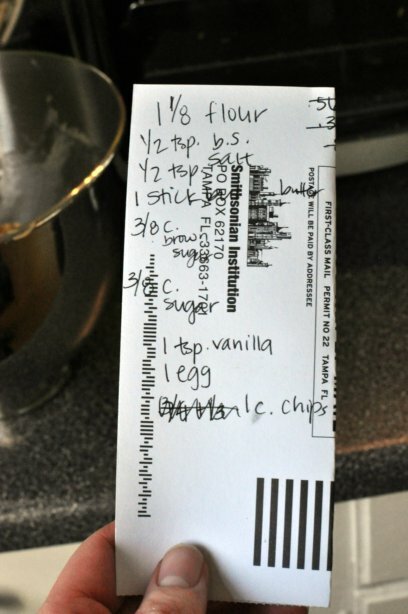 Bake 10 – 11 minutes. Allow cookies to cool on pan 1 minute before removing. Serve warm. *Dough may be stored in the refrigerator for up to a week or 8 weeks in the freezer. I just love this new color of Kitchen Aid Mixing stand, don’t you? It’s called Flamingo. 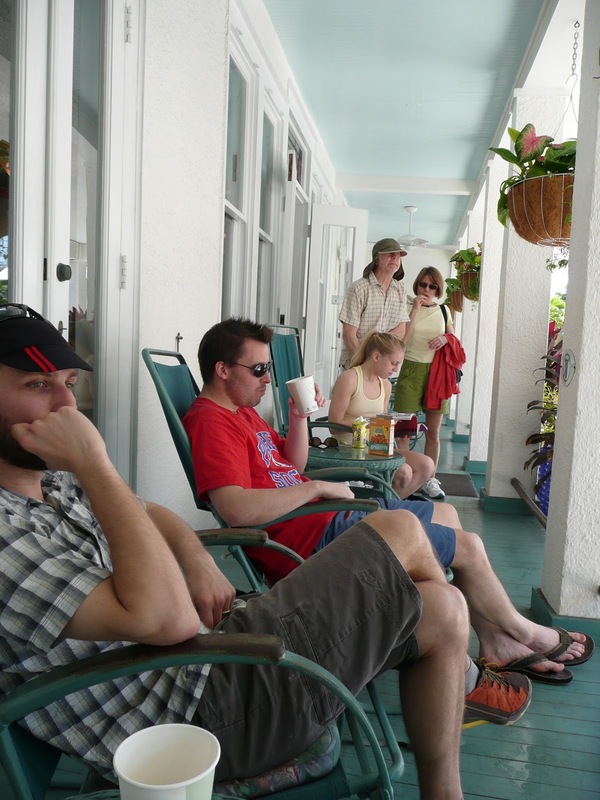 Key West, Florida is a family favorite locale. 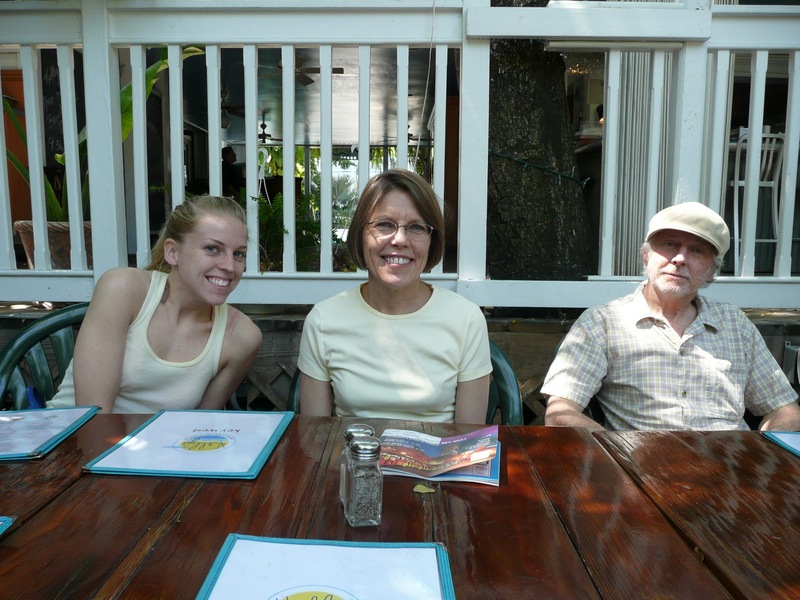 My parents and sister have been there more frequently than Eric and I – we have only been twice now. I know, the shame! Poor Greta has yet to experience Key West. 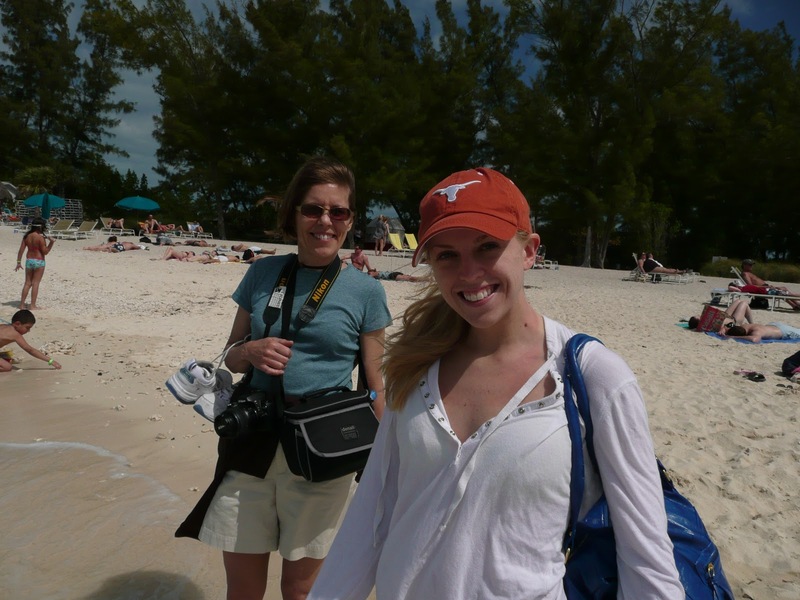 I have been daydreaming of spring break trips this year, as we are not likely to have one with the process of packing, selling a house, and moving on our radar this spring. 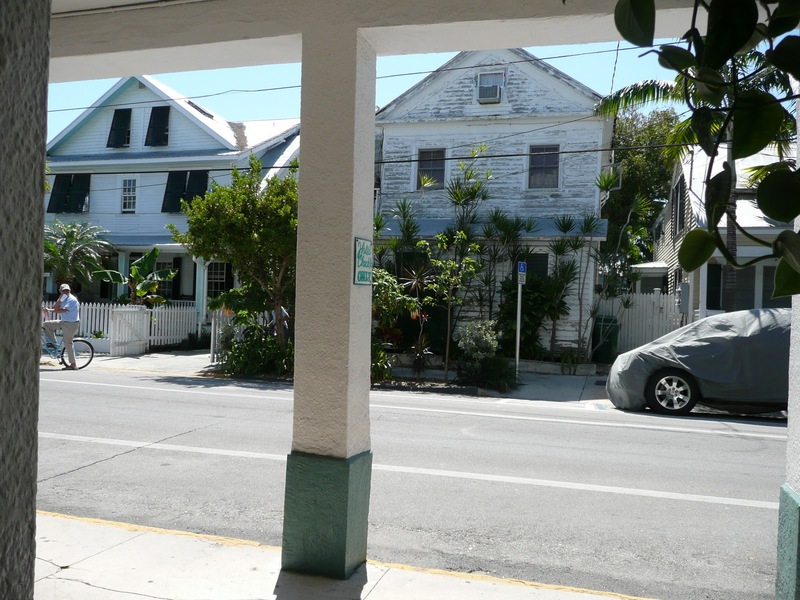 So, on this nice and sunny, 60 degree day in Greensboro, I dream of Key West. 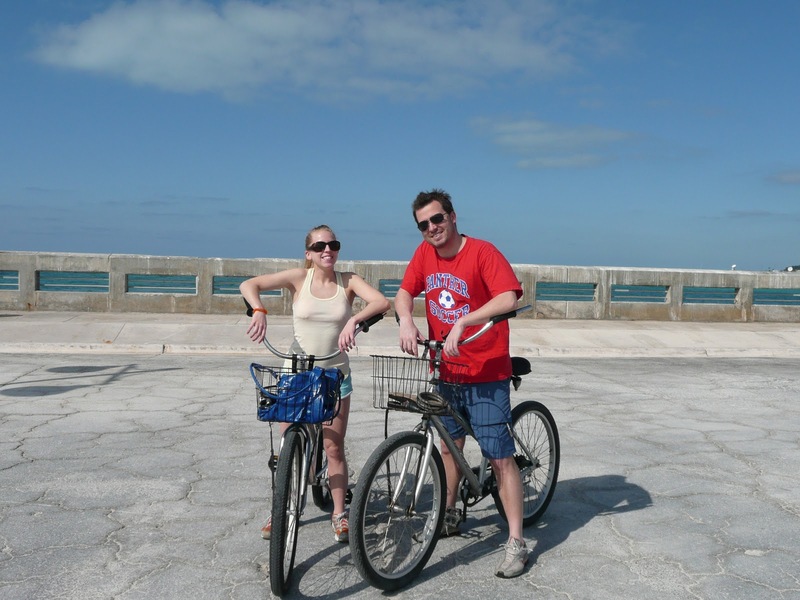 Read on to find some highlights of our last trip to Key West in April of 2010 plus an easy side, a Key West inspired recipe – Lemon Garlic Roasted Carrots. My family always stays in the same place – the Eden House. This place is heaven. This is the elaborate system of walkways with privacy fences between the pool and one of the houses that has been converted to suites. We stayed on the second floor of one such suite. There are a variety of rooms, suites, and even condo-like setups. 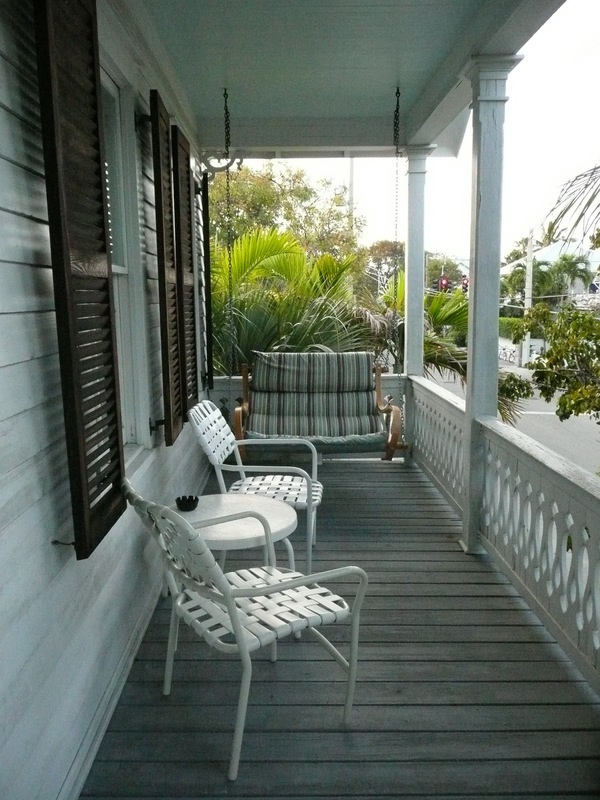 The front porch of the Eden House – I could spend an entire day sitting here watching Key West amble by. This is our post wake-up and pre-breakfast meet-up. This particular trip included myself, Eric, Brady (brother-in-law), Caroline (sister), my dad and my mom. Our suite had a porch off the back with chairs and a swing. We spent most of our evenings out here watching the tour buses and people go by. 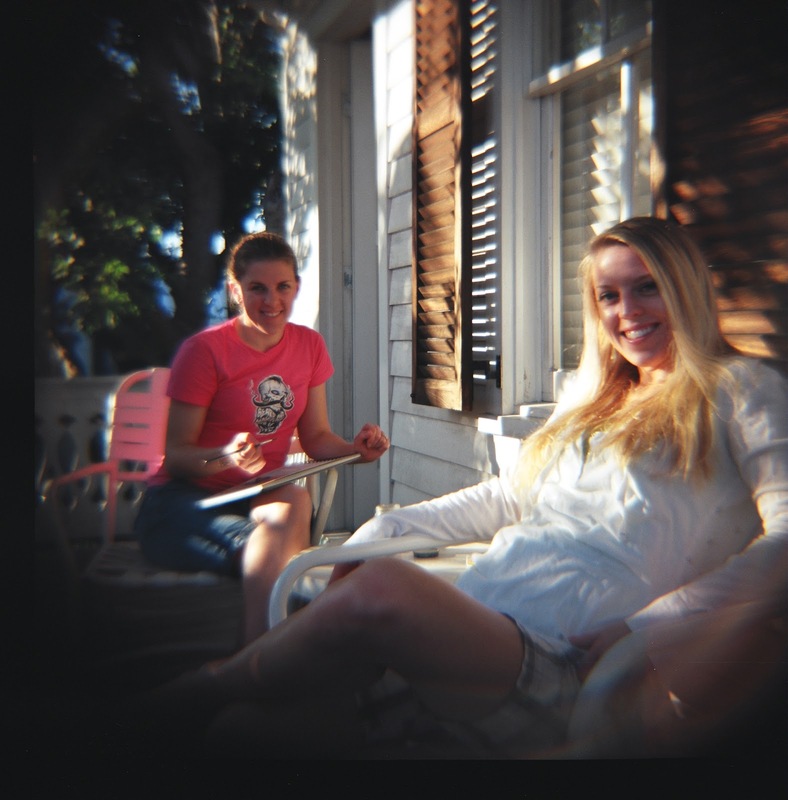 Eric and I love to take our Diana camera along on vacations – it takes lovely dreamy photos. 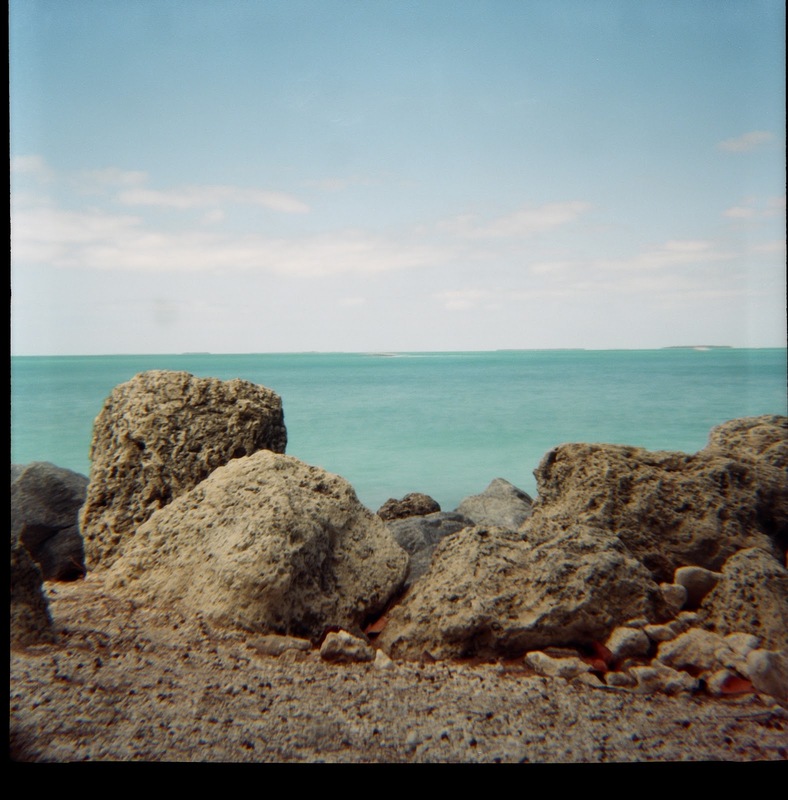 Analog film is still better than Instagram, if you ask me. I was working on a watercolor painting of Eric sitting in the swing. 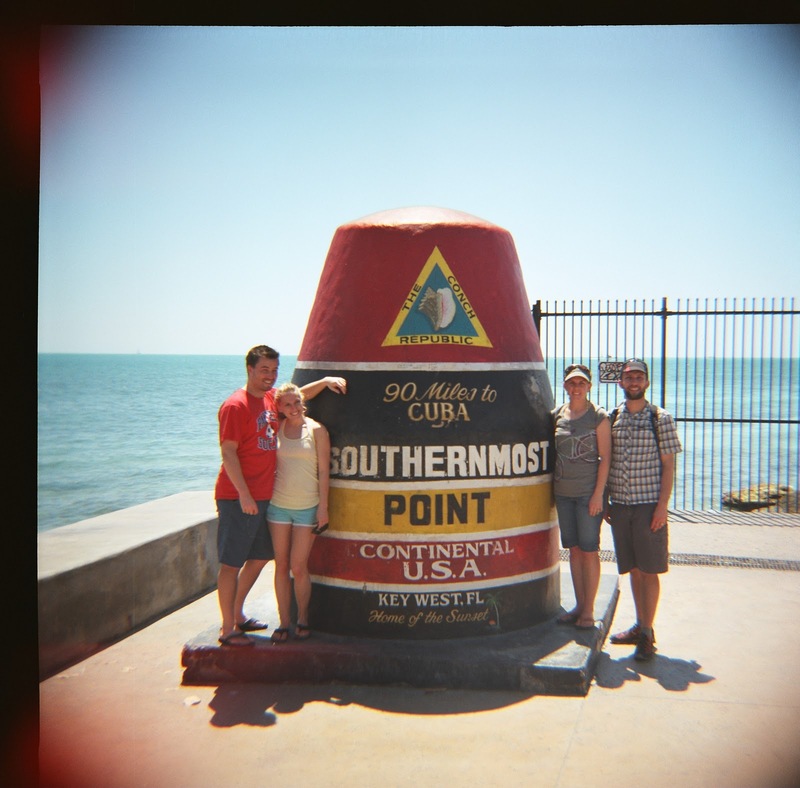 The Southernmost Point is a fun place to visit. Be prepared to wait in line for your turn to take a photo, though. 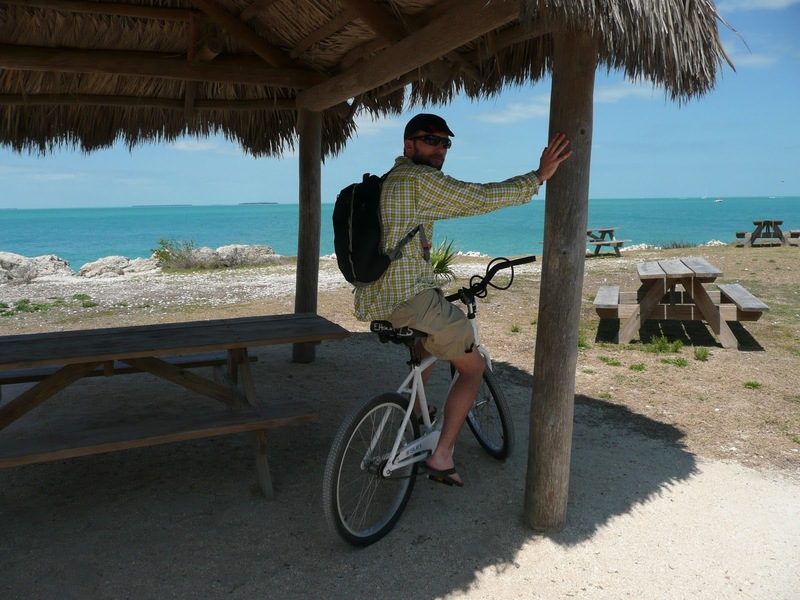 Fort Zachary Taylor State Park is a great place to ride your bike to. They always have interesting sculptures set up along the walkways. This year was no exception – this one made from twigs framed the water beautifully. Bring water along – the ride is warmer and sunnier than you think, but there are concessions to purchase at the park. wade in the water, and enjoy a walk on their paths. 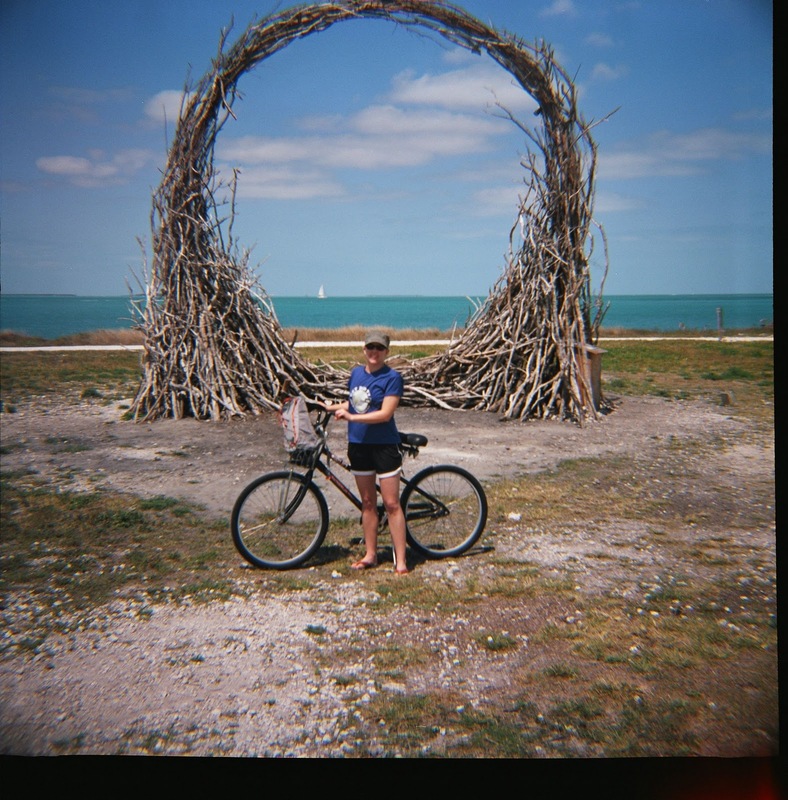 We ride our rental bikes everywhere on the island. 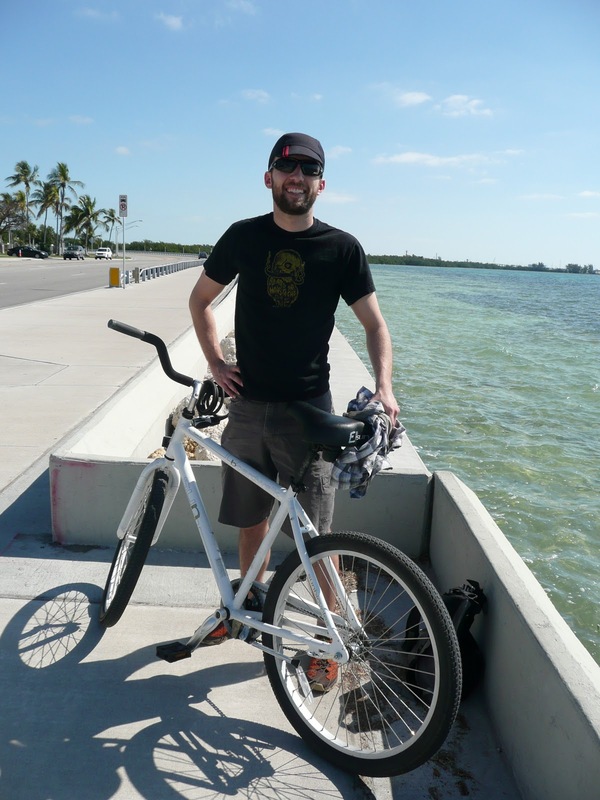 The island is flat and the roads easy enough to ride on – cars are well-versed in tourists on bicycles. We enjoy riding around the entire edge of the island at least once. This trip always takes us out to the pier. 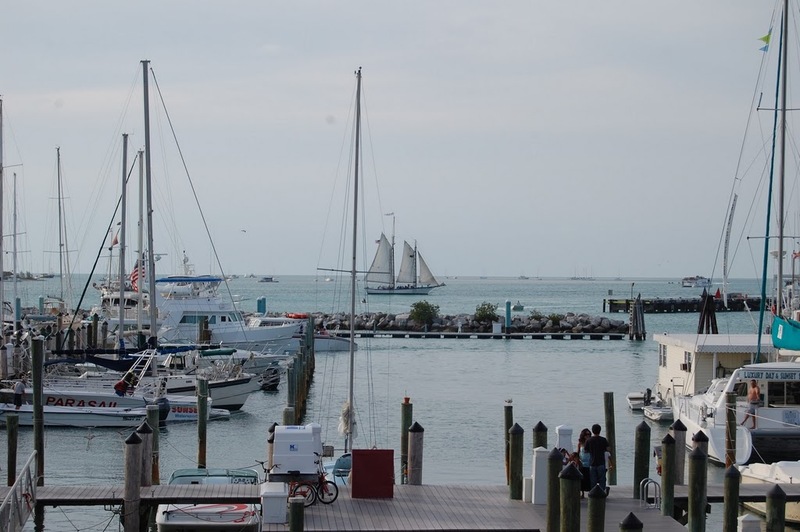 Everyone smiles in Key West – how could you not with this backdrop? 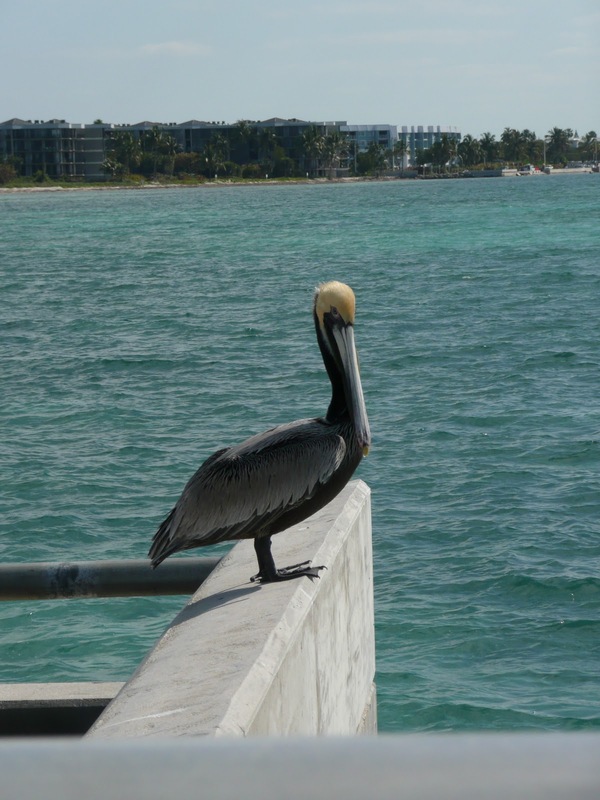 Usually we see pelicans on the pier. The wide path behind Eric is what we ride on for a good length along the beaches. I can almost feel the ocean breeze now. Sigh. 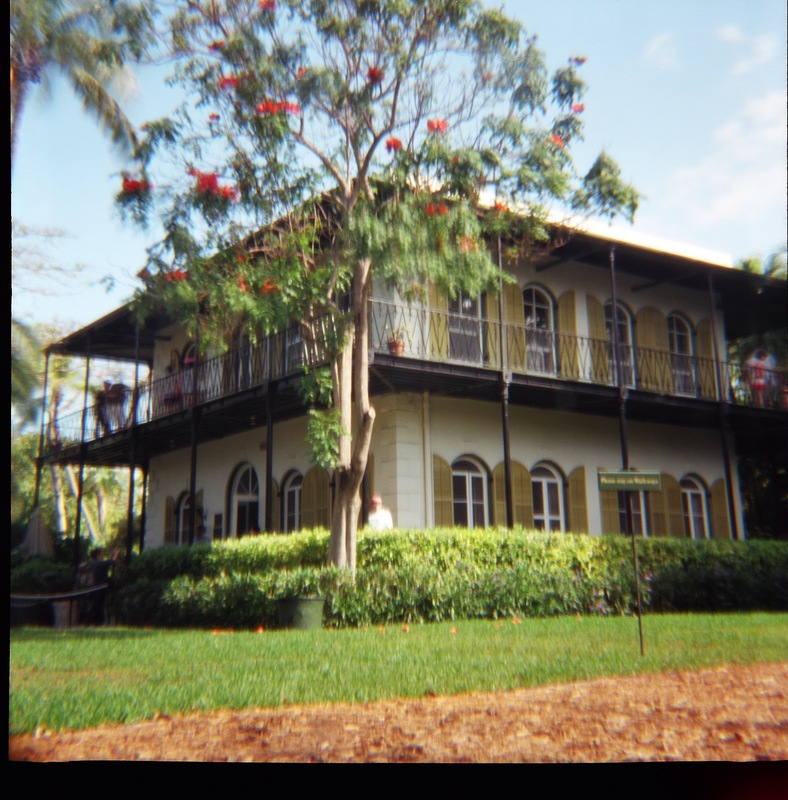 We always make time for the Ernest Hemingway home. 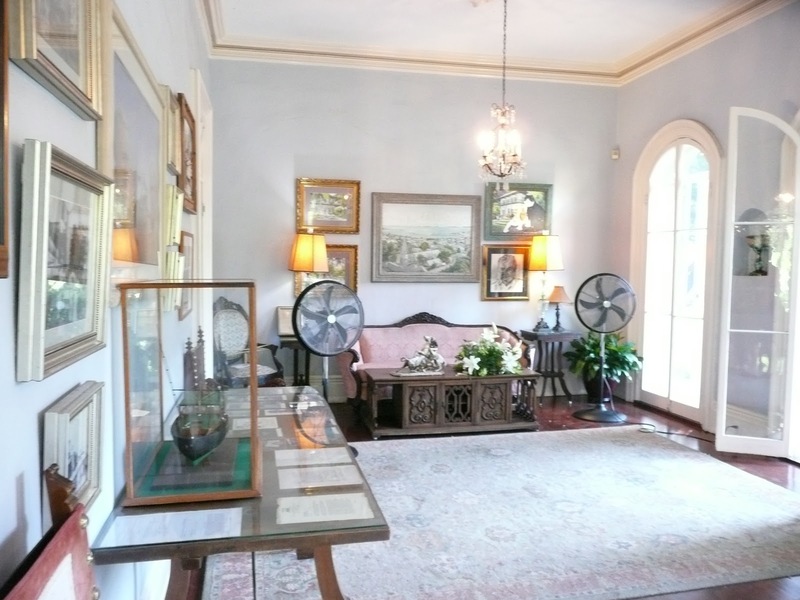 This beautiful home was built in 1851 and became the famous author’s home in 1931. I love the two-story porches and green shutters. 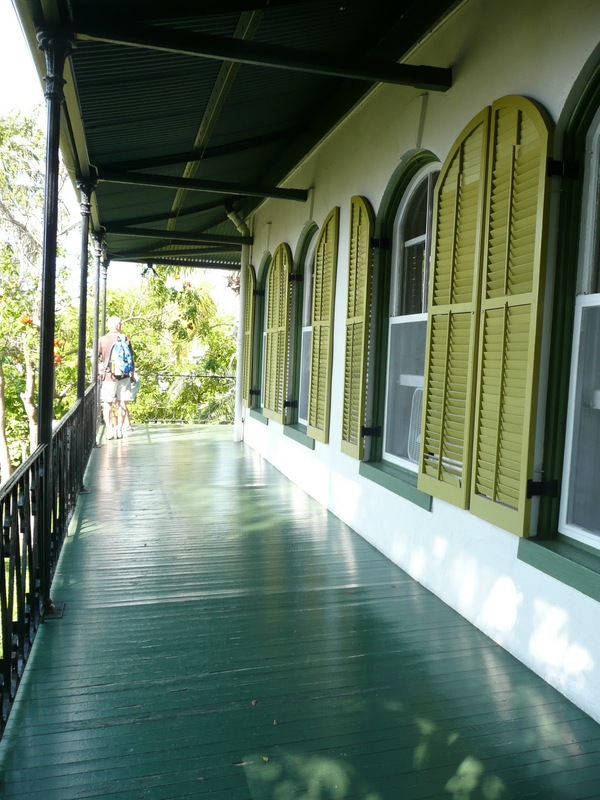 The furniture inside the home was used by Hemingway and his family. 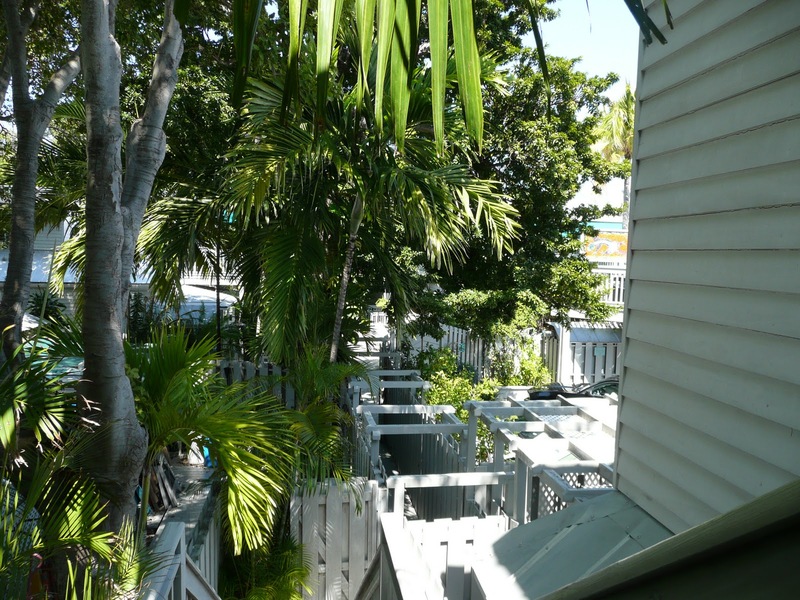 The different shades of green are fitting for a Key West home. I love the painted floors! The home and gardens are filled with cats. 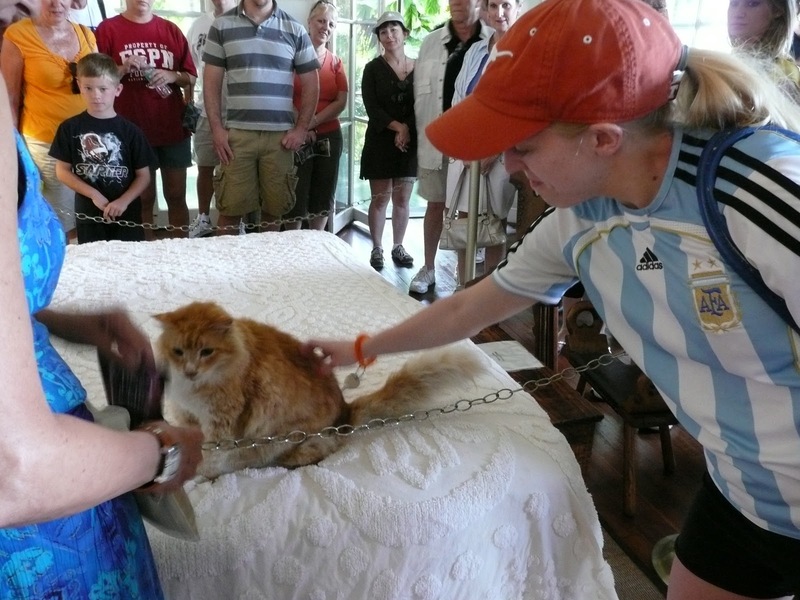 There are about 40-50 poly dactyl cats around the house and grounds – all descendants of Ernest Hemingway’s 6-toed cat named Snowball. This particular marmalade enjoys its place on the bed. 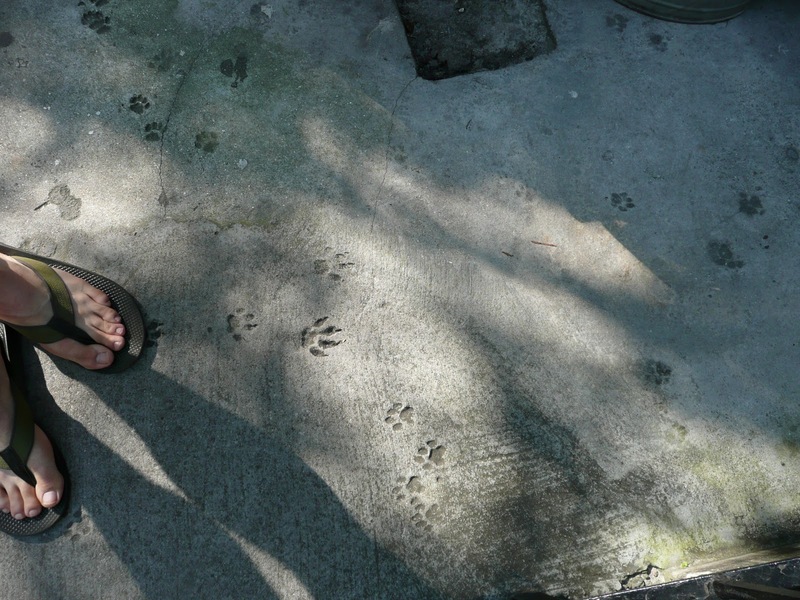 There are signs of the cats everywhere – footprints in the concrete around the house and pool. 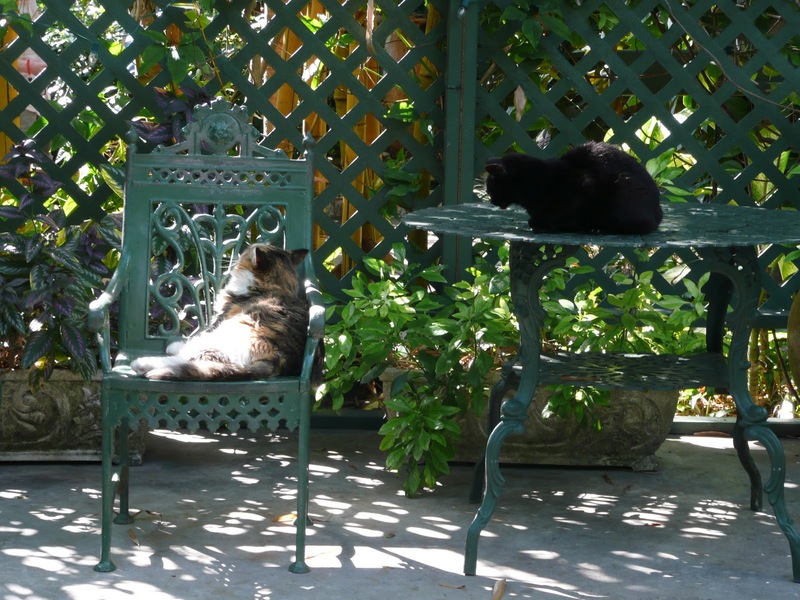 The cats are sleeping on furniture, in the gardens, and in the house. 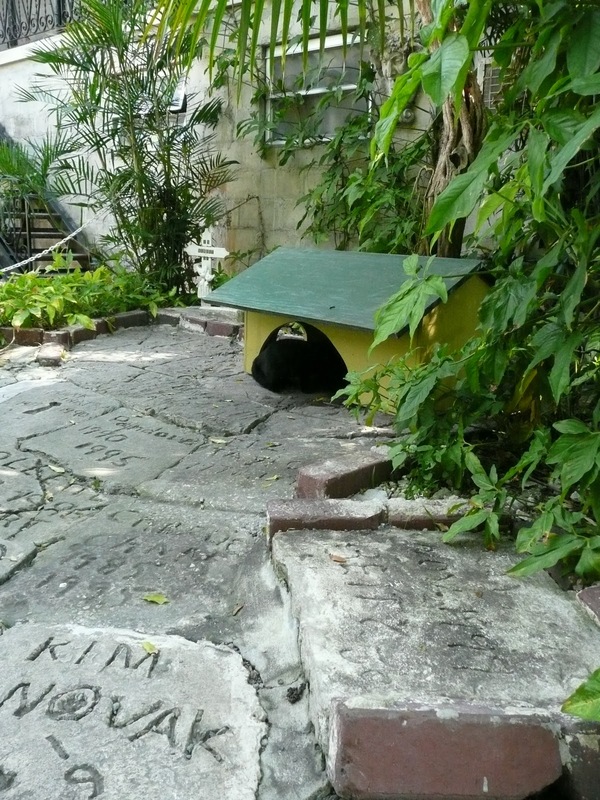 There is even a little cat graveyard in the garden, complete with a cat house for the living. 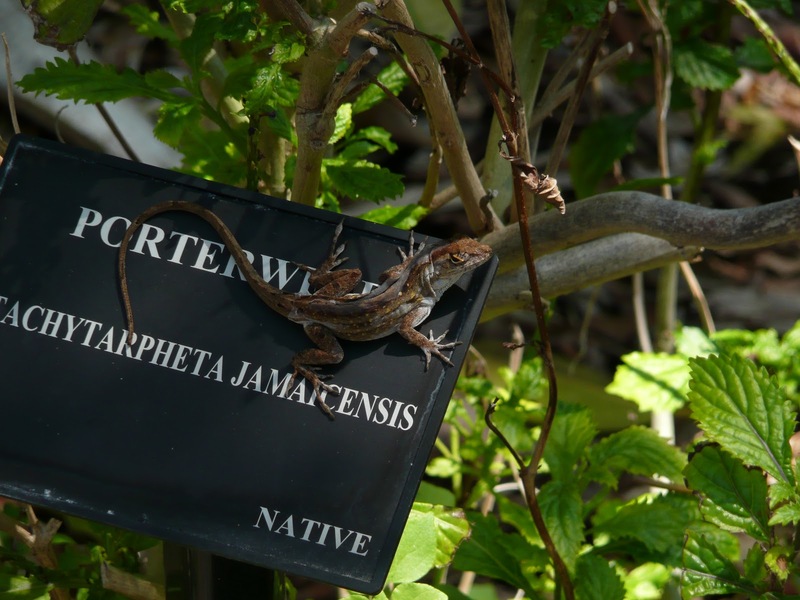 This last trip, we headed over to the Martello Tower, which is now the Key West Garden Club. 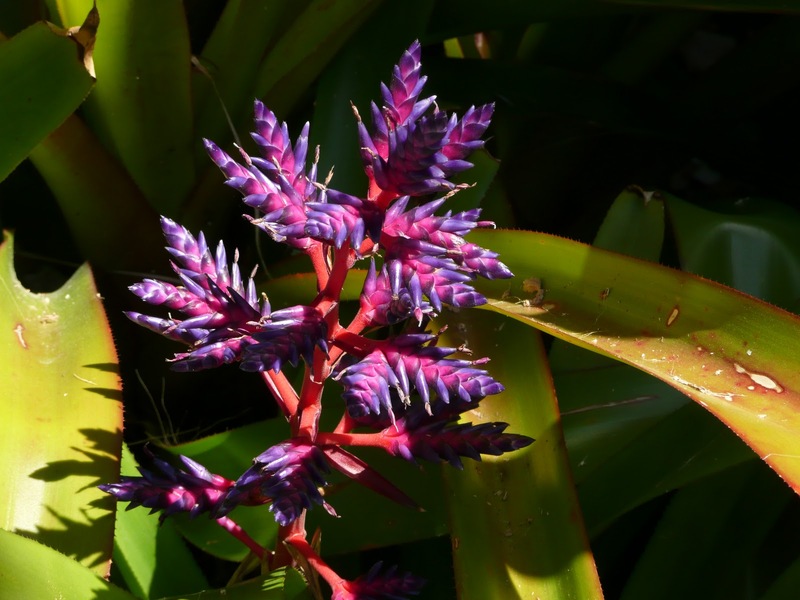 This is a free destination in Key West and was once a fort during the Civil war, but now home to a lush garden full of interesting plants. 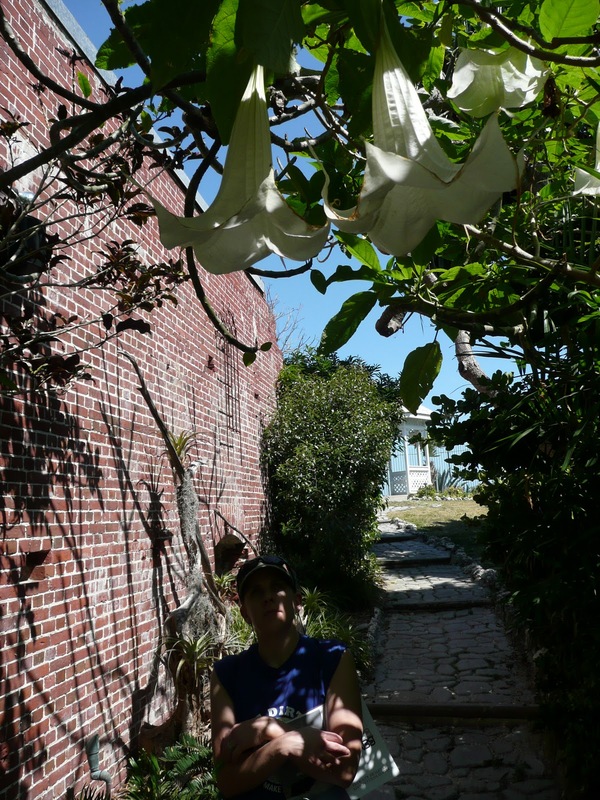 These white angel trumpet flowers formed a shady canopy overhead. The colors were just a riot. 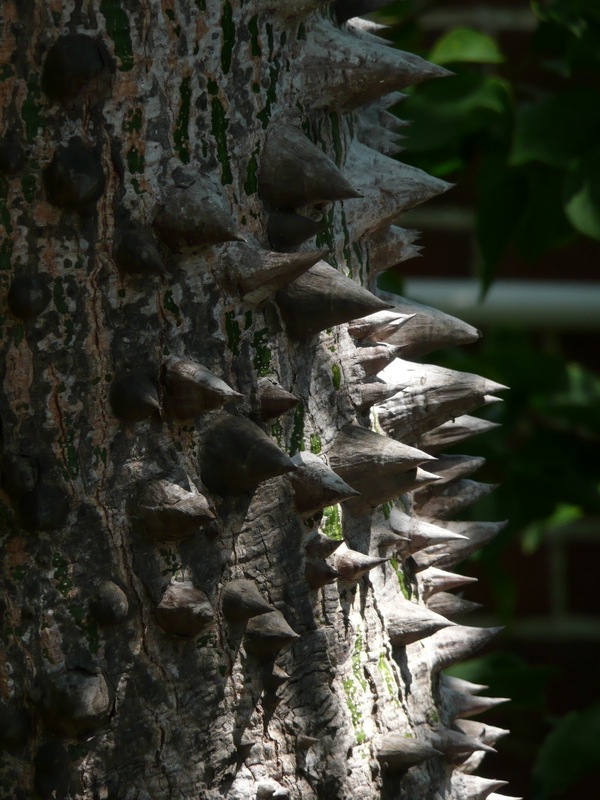 This spiny tree was my favorite. 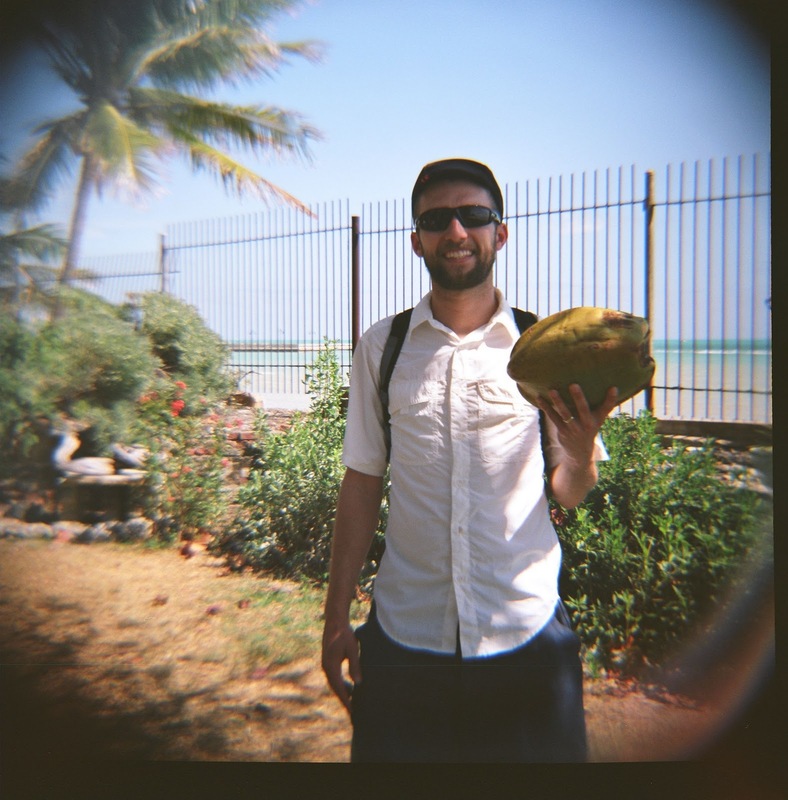 Eric even found a coconut. The inside of the Key West Garden Club still looks very much like a military fort, except for the motorized wooden chair mounted on the wall. This was another one of the artworks that can be found all over the island. Blue Heaven is our favorite breakfast place in Key West. 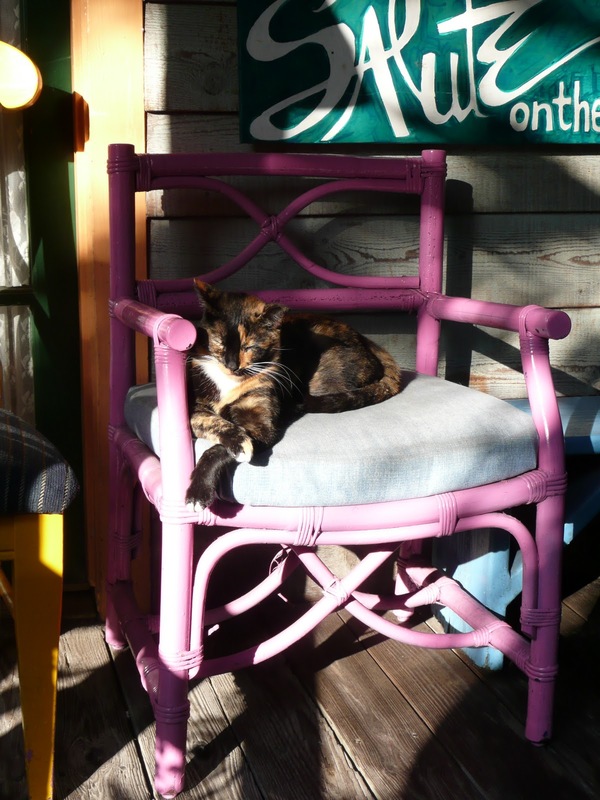 This pretty calico was sunning herself on the porch at the entrance of this interesting place. 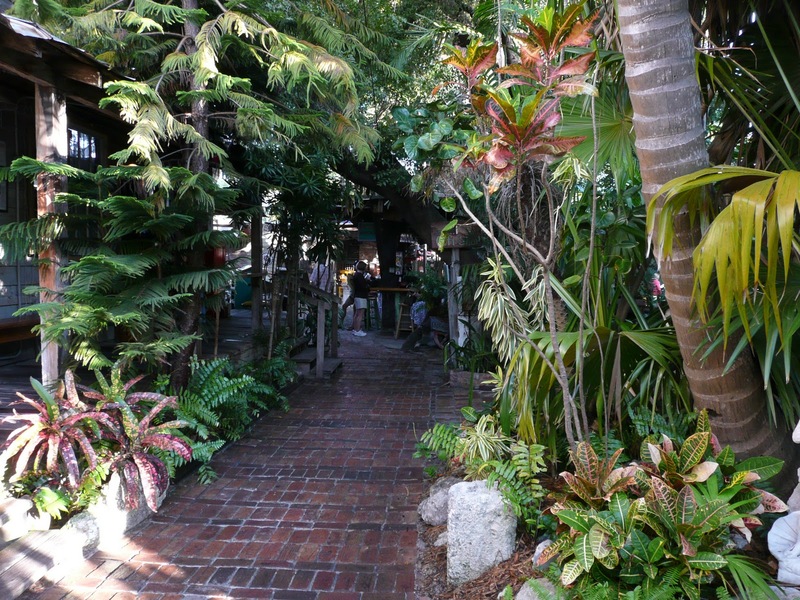 The walkway into the restaurant’s courtyard is paved in brick and lined in lush foliage. Once inside the courtyard, you are in, well Blue Heaven. 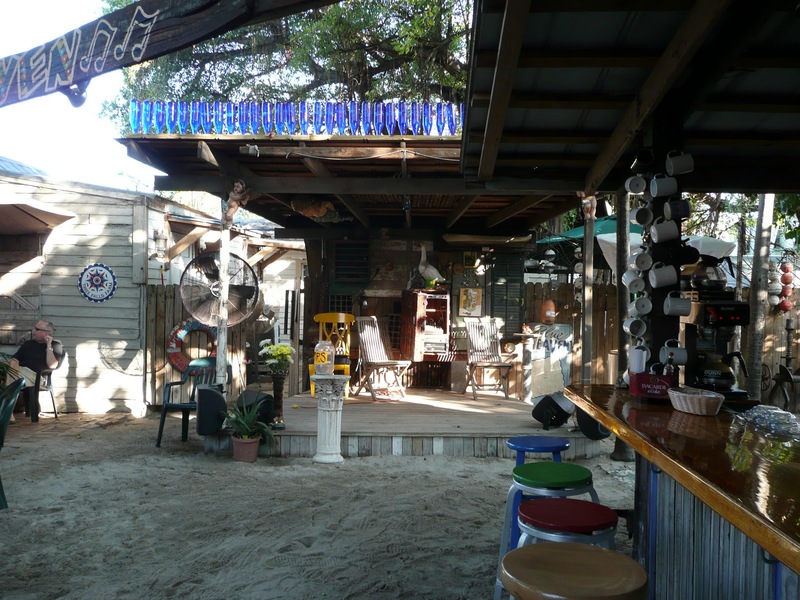 The stage hosts live music, the bar is stocked for breakfast or drinks, and the ground is sand and usually teeming with chickens. 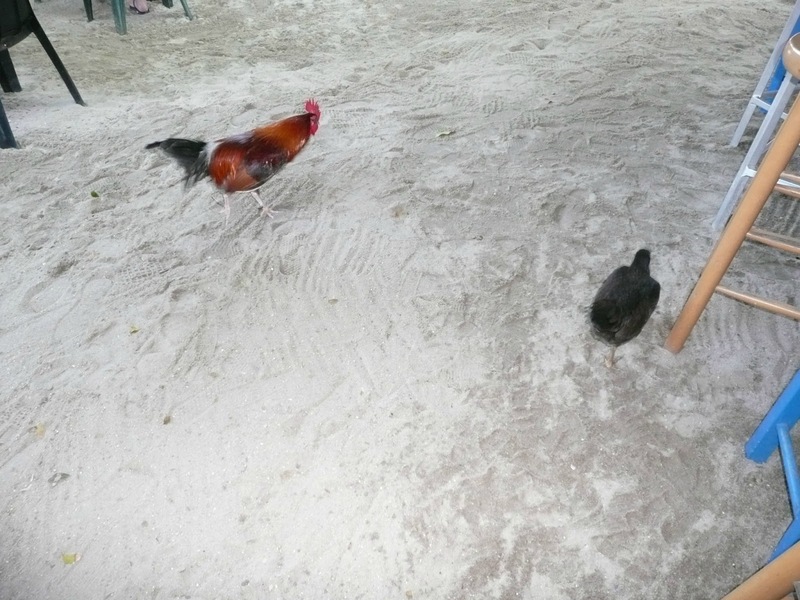 We watched this hen and rooster scratch around while enjoying some of the best banana bread on earth. 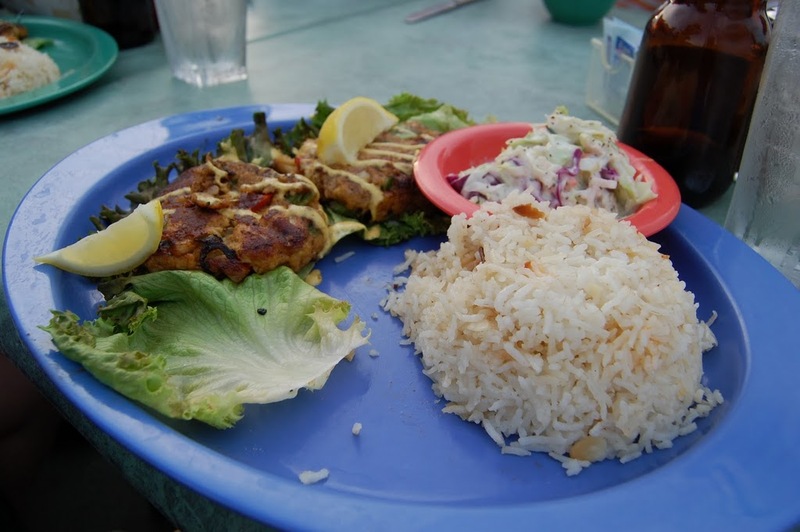 Another fun place to eat is Kelly’s Caribbean Bar, Grill & Brewery. This is in the former headquarters of Pan American Airlines and boasts themselves as the southern most brewery. It has a wonderful second floor deck/patio we like to sit at while we enjoy its very own beer. I enjoyed the coconut shrimp and Havana Red Ale. 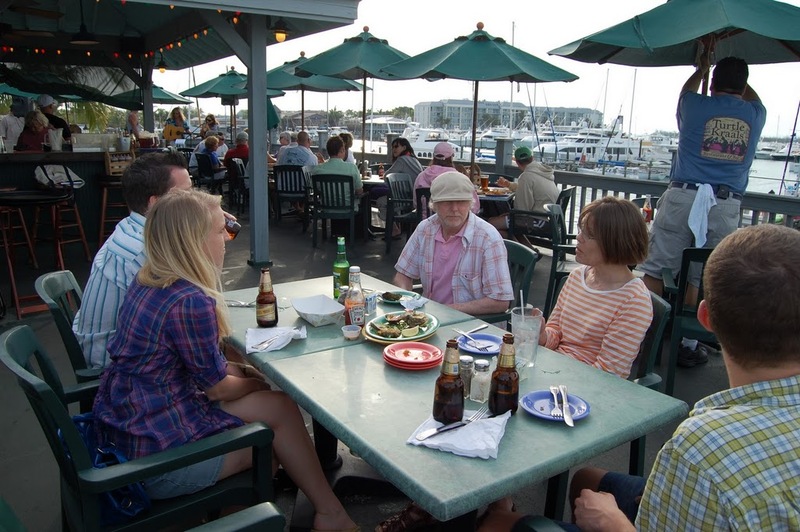 A great place to eat with a killer view is Turtle Kraals. 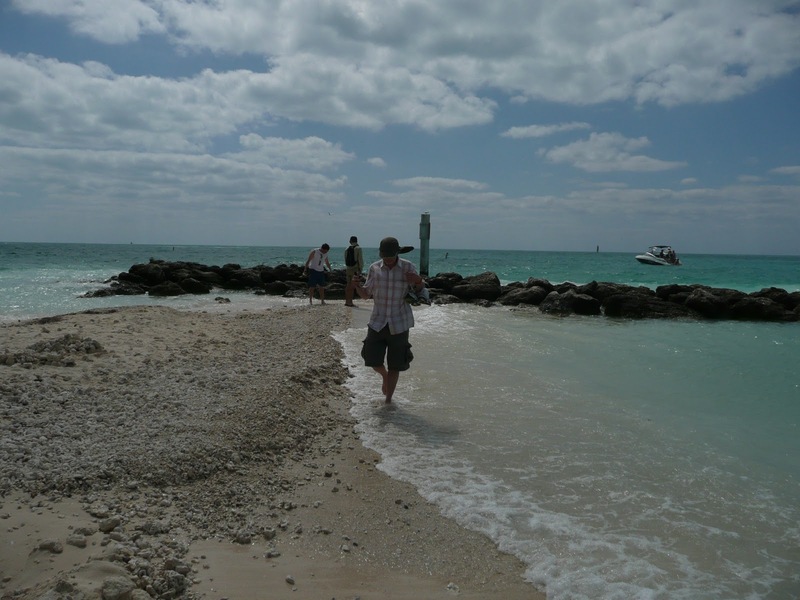 We found ourselves at here after a day of wandering around the island, before heading to Mallory Square for the evening entertainment. The rooftop views of the boats and the marina can’t be beat. This is a lovely place to enjoy drinks while the sun sets. I ordered an amazing meal of mango crab cakes with coconut rice and a creamy, tropical coleslaw. Heaven on a plate! But I will have to make do with Lemon Garlic Roasted Carrots in the meantime. 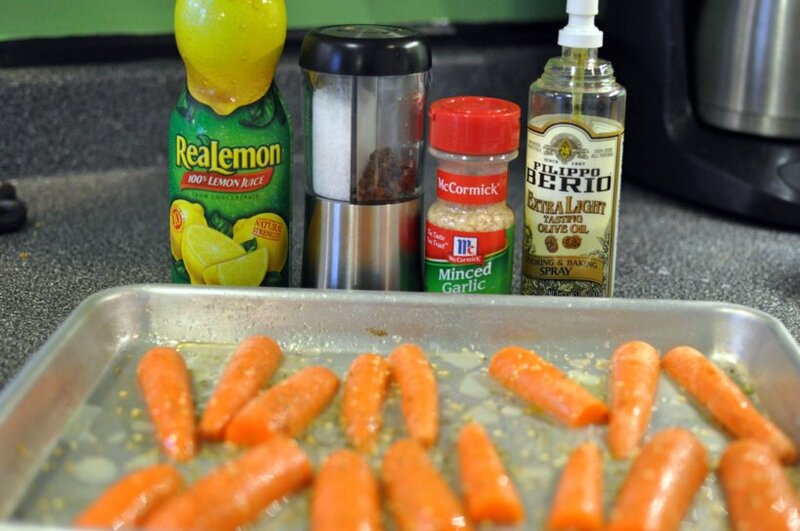 This recipe is so easy – it takes only the above ingredients, and after slicing my carrots, I prepared the rest with only one arm, due to a Greta Monster. These are a delicious side to any meal, are fast, easy, and cheap! 1. Slice 4 to 6 carrots in half, lengthwise and again in half, vertically. 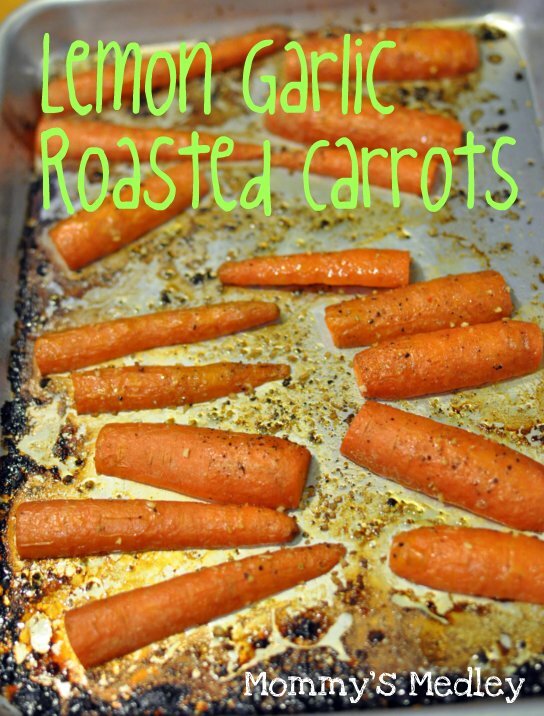 Arrange carrots on a rimmed baking sheet. Spray with olive oil. Sprinkle with fresh ground pepper, dried garlic flakes, and lemon juice. 2. Bake in a 450 degree oven for 15 to 20 minutes, or until softened and sauce is bubbly. 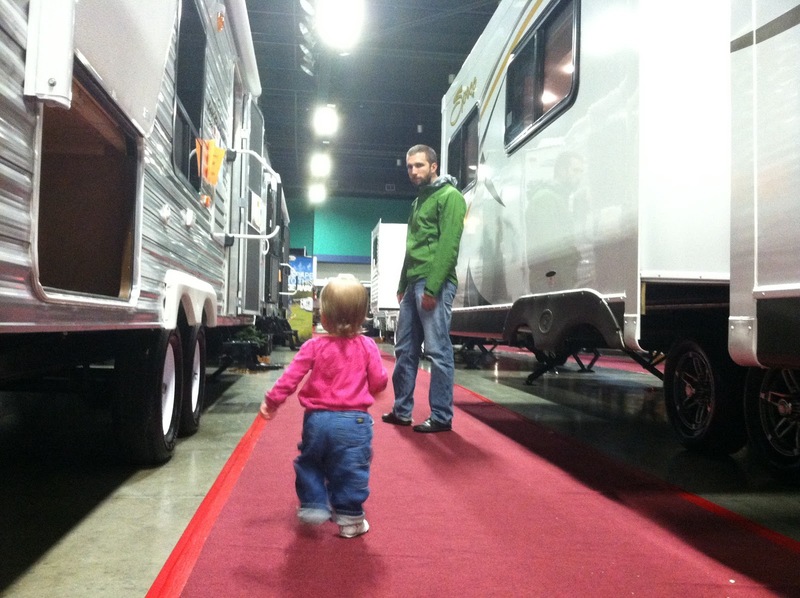 Last weekend we went to the RV show – a great activity on a cold, wet night. It was fun to climb inside the various RVs and imagine trying to vacation this way. Some of them legitimately have more square footage than our house! Greta loved running up and down the red carpeted aisles. She enjoyed climbing up and down the steps to get in and out of the RVs. We only had one spill that resulted in a carpet burn across her forehead. Otherwise, pure fun. Why is this at all relevant, you ask? Mommy’s Medley will be relocating to Iowa. An RV makes the thought of moving 1,000 miles with a toddler, 1 dog, and 2 cats seem more bearable. So, the cleaning out and de-cluttering has begun. It started with moving furniture, dusting, vacuuming, primping, boxing, and bags and bags of donations. 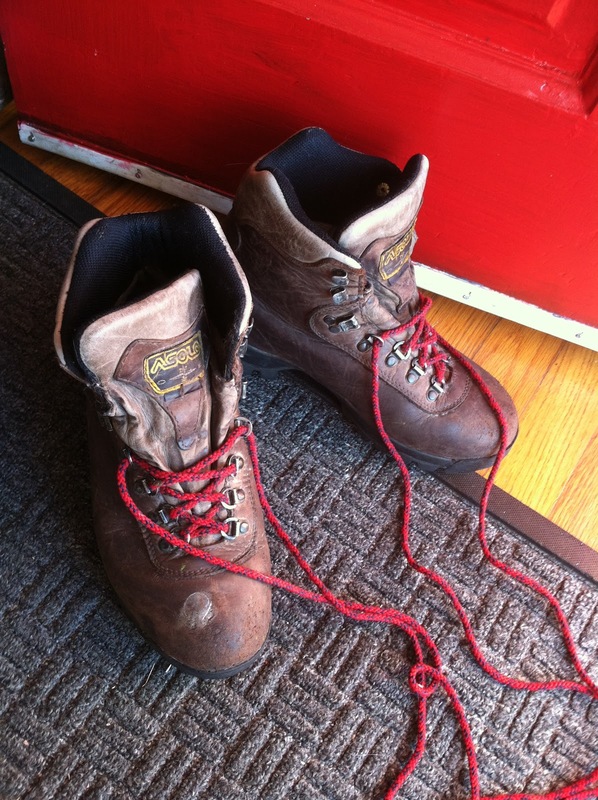 Why did I have three pairs of hiking boots? 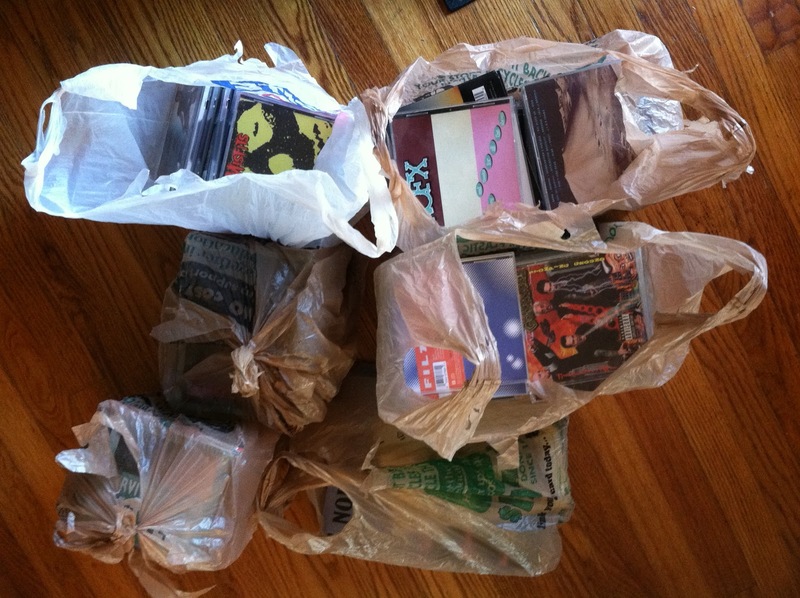 Why did I spend enough money to feed a small village on CDs? This is only a small amount, too. But then came the fun part! 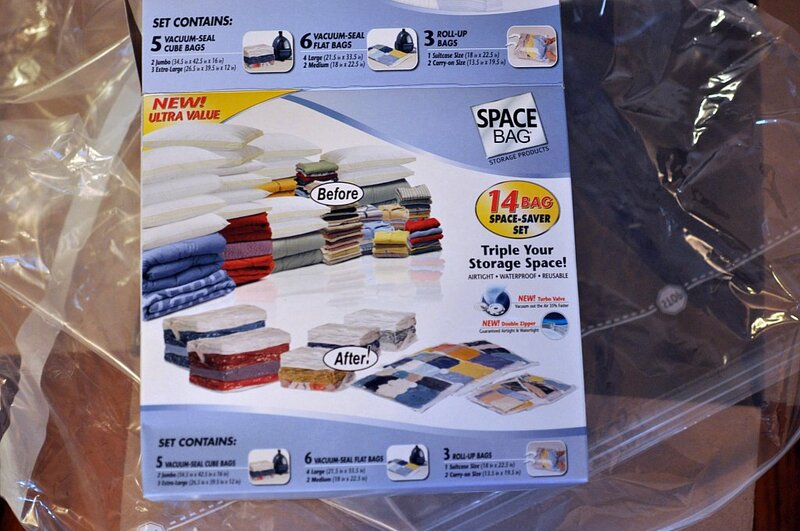 Eric ordered these Space Bags to help us pack the large amounts of soft, space consuming items we own. I am behind on the times, I guess, but these are amazing! 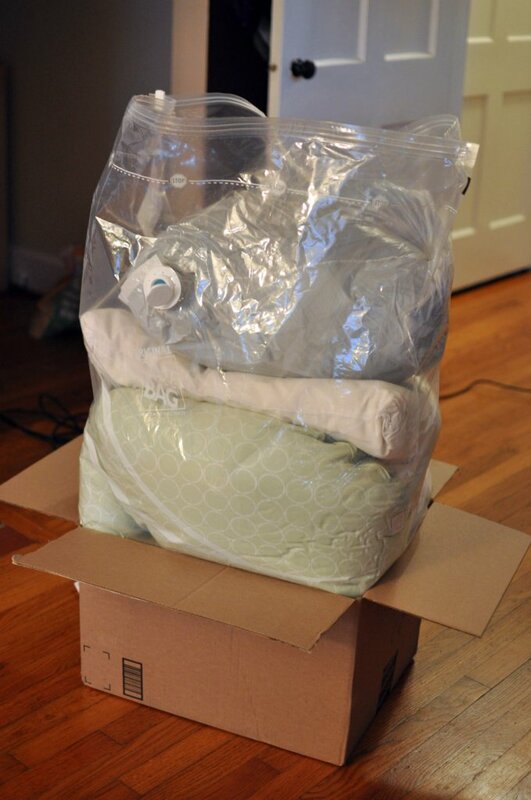 Eric was admittedly skeptical on the effectiveness of these Space Bags, but once he got the hang of it, nothing was safe from being vacuumed sealed. First, put the bag into a box. 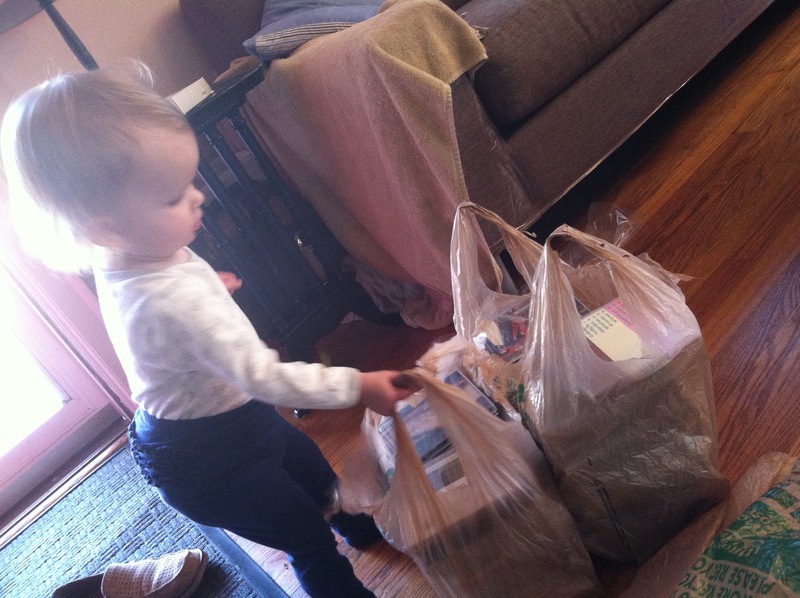 Then, fill the bag to the fill line. 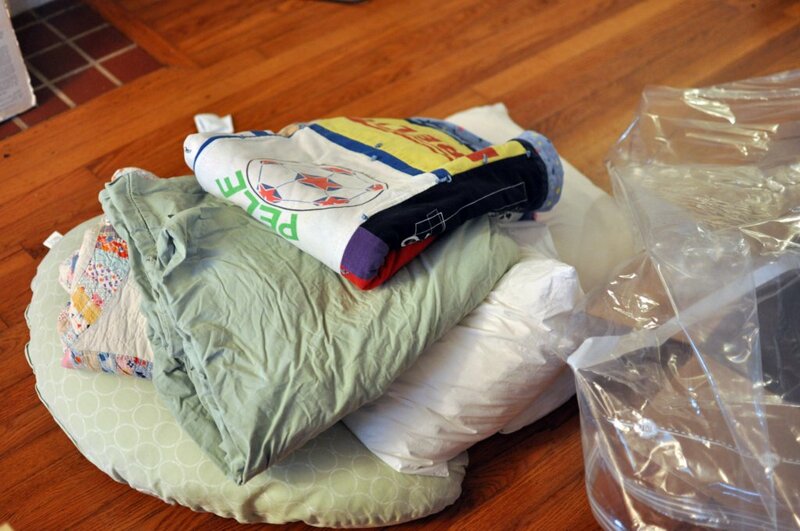 This bag has 1 set of sheets, 2 pillows, and 2 quilts in it. 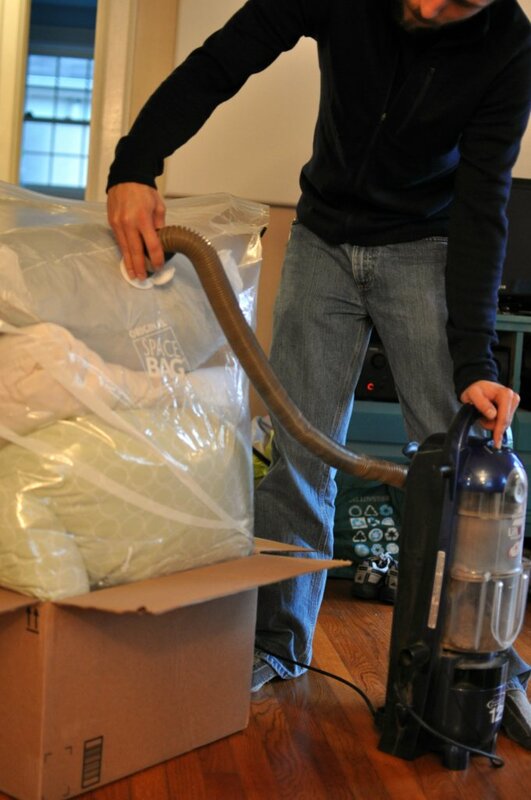 Then, seal the bag with the zipper clip, attach the vacuum and turn it on. Immediately the bag begins to shrink. 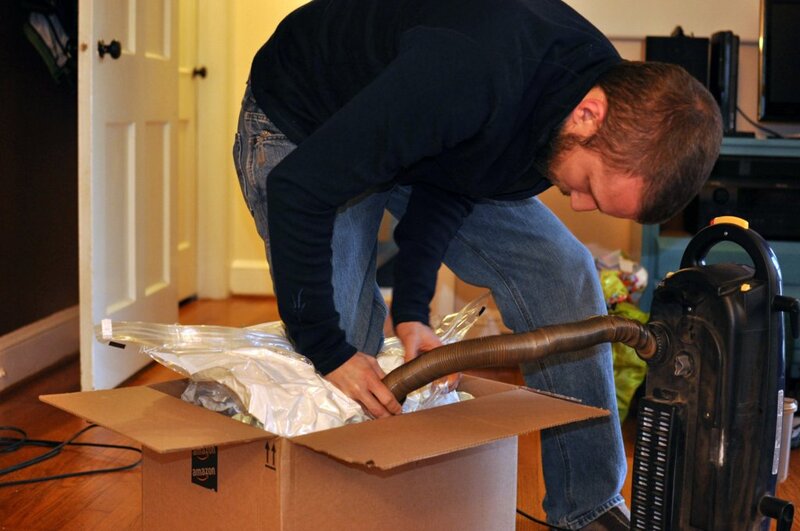 Until it neatly fits inside your box! 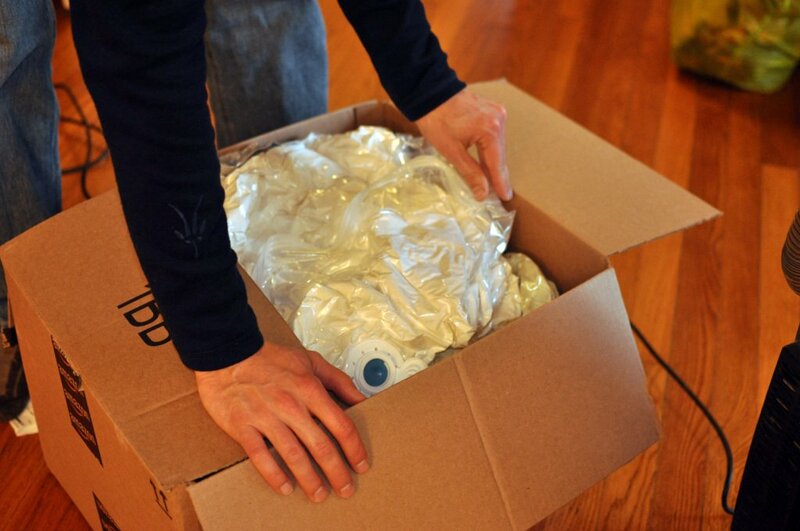 Seal up and label your box – Eric was smart and wrote a reminder, “No knives to open.” Read the directions before using, we ended up resealing a couple bags after realizing it isn’t smart to use these with leather jackets and you should not over vacuum down items. 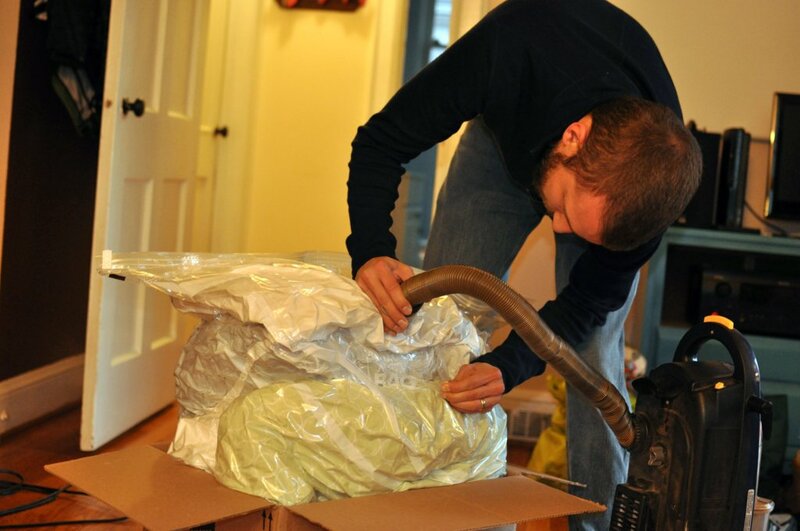 Stay tuned for more fun packing, moving, and house staging items. Until then, I am dreaming of Iowa. These bags are great for travel too! This recipe is a a simple one with only a few ingredients. I have found that my favorite soups are the most simple – tofu, mushrooms, carrots, soba noodles, and a spicy broth make this soup delectable. 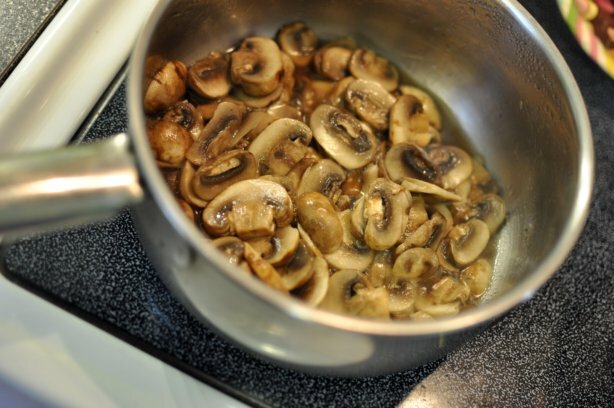 The mushrooms are sauteed in wok oil, for more flavor. Add them to the broth after the juices have released. 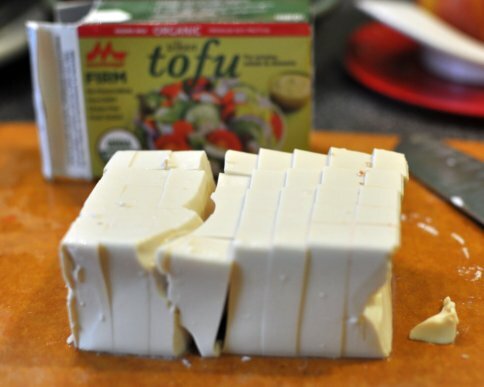 I always choose firm or extra firm tofu for my recipes. 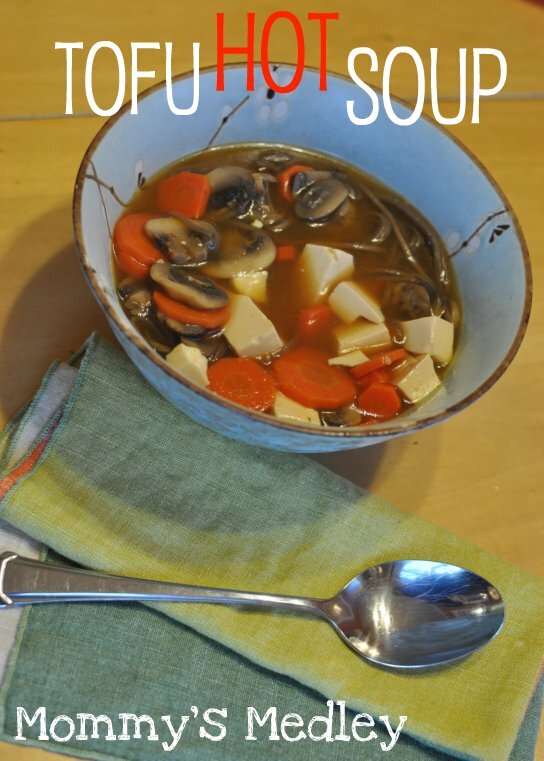 The tofu complements the mushrooms and soaks up the flavor in the broth and couple be easily swapped out for chicken or another meat, or omitted completely if you are not a tofu fan. 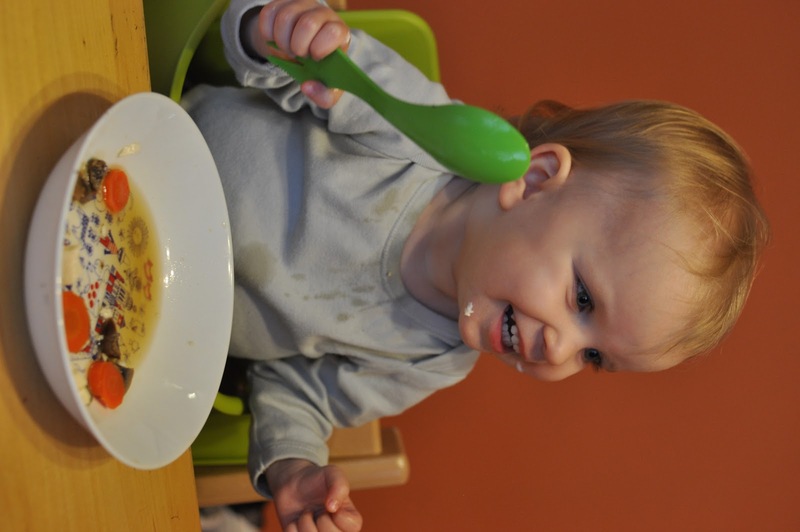 Greta loved this soup and ate her fair share. It was just what the entire family needed – a spicy, satisfying soup. If you can make this recipe ahead of time, this soup tastes even better the following day, after the flavors have had time to really come together. 1. In a large pot, bring to a boil: 5 cups vegetable broth, 2 tablespoons soy sauce, 1-2 tablespoons Thai red curry paste, 1 teaspoon dried garlic, and 1 cup thinly sliced carrots (about 3 medium carrots). 2. 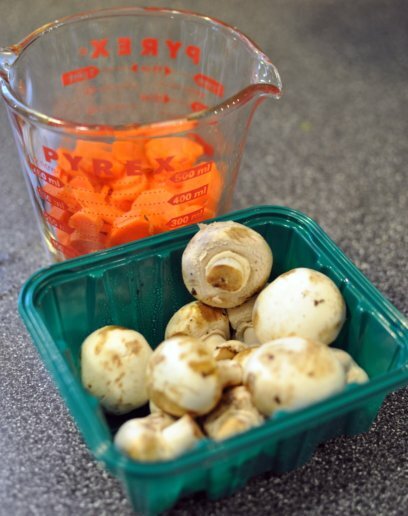 Remove woody stems and slice, 8 oz of bella mushrooms. Saute in a covered small saucepan with 2 tablespoons wok oil, over medium heat until juices are released. Add to broth mixture and reduce heat to low. 3. Slice 1 carton of soy into 1/2 inch thick slices, add to broth mixture. Simmer on lowest heat setting for 30 minutes. Then, add 1 bundle of wheat soba noodles. Cook for 5 to six more minutes, stirring frequently to prevent noodles from sticking. Serve warm. 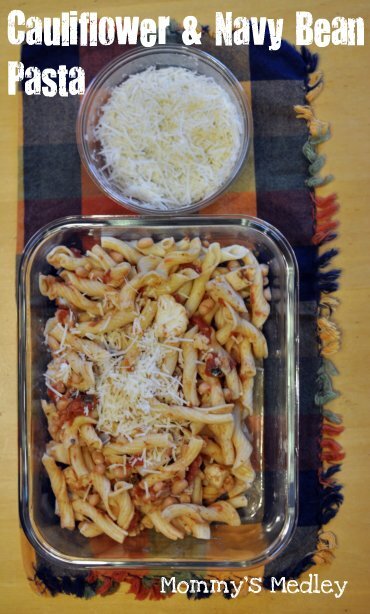 This easy and filling pasta takes no time at all. It is vegetarian and can be vegan with the absence of that sprinkling of Parmesan cheese on top. 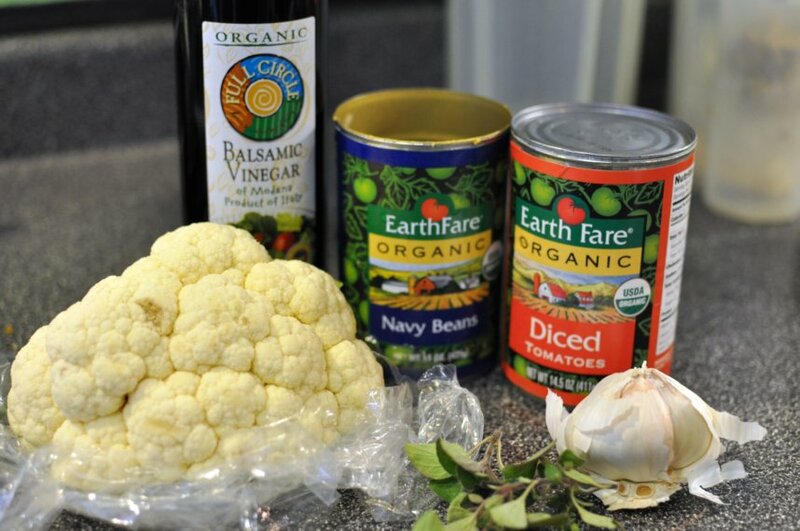 To make this recipe, you need cauliflower, diced tomatoes, navy beans, garlic, fresh herbs, and pasta. That’s all! The fresh herbs came from my garden – I love this about North Carolina – the ability to step outside and pick fresh herbs all year long. Start the sauce first, by simmering it in a skillet. This way, the pasta is done and the two can be combined. This dish is an easy, 2 pan meal, 1 bowl meal. I will say, my toddler, Greta loved this meal. She kept calling the beans eggs, but hey whatever works. At least she ate them and liked them. 1. Chop 1/2 head of cauliflower into 1-inch chunks. 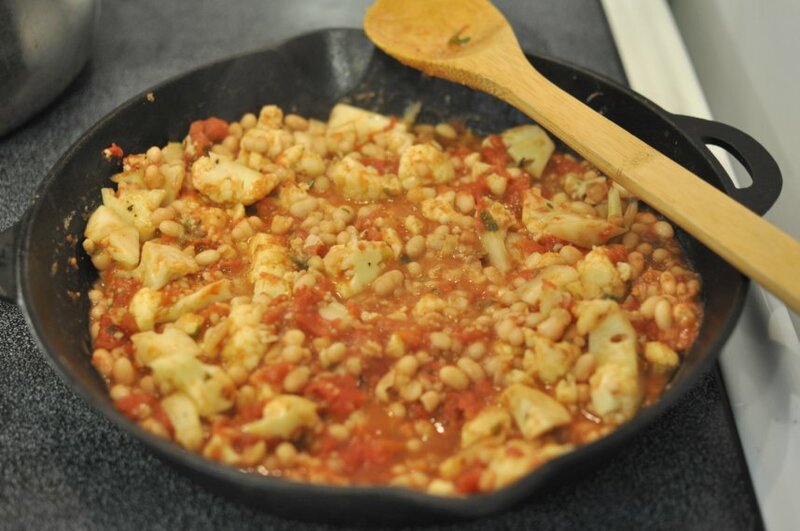 Heat olive oil in a large skillet, add cauliflower and cook over medium low, stirring until browned. Add 3 cloves of garlic, minced and cook 2 to 3 more minutes. Add 1-14.5 oz can of diced tomatoes and 1-14.5 oz can of navy beans, rinsed. Chop 1-2 tablespoons of fresh thyme and oregano, add to skillet. Stir and turn heat to low. 2. Bring a large pan of salted water to boil. Add 1 box or bag of pasta. Cook following directions. Before draining, reserve 1/4 to 1/2 cup of the cooking water. 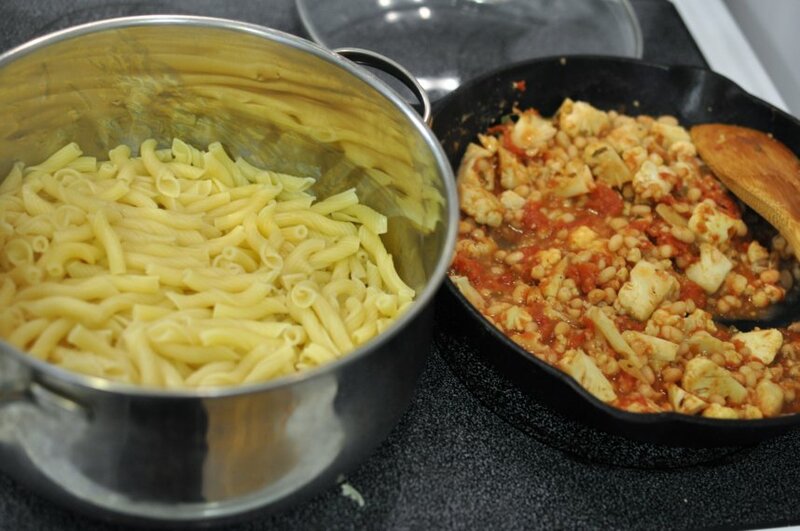 Add the water to the sauce in the skillet – more or less depending on how much the sauce has thickened and how thick or thin you prefer your sauce. 3. Drain pasta. Return to pan and combine with sauce. Serve with sprinkling of cheese, if desired. Have you tried these suckers? Love them! 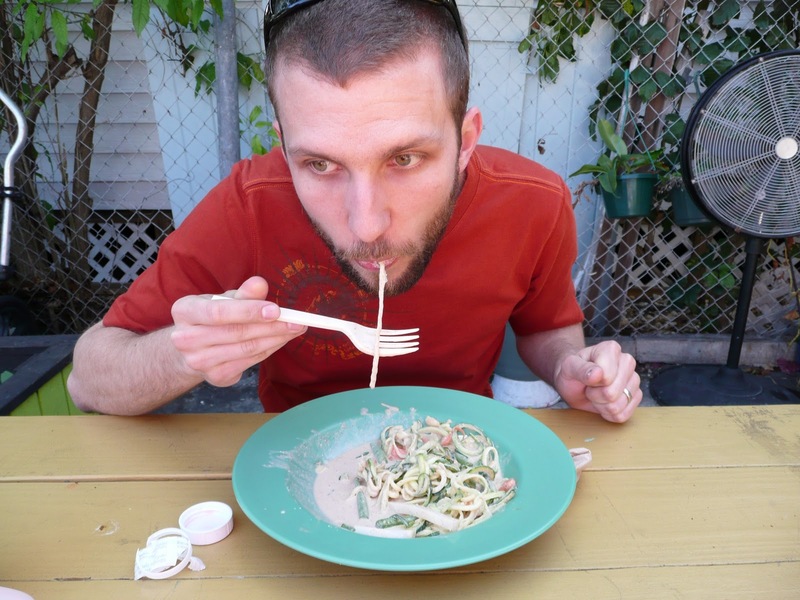 They are glass, never leak, great for lunches or leftovers, and no nasty stains in the plastic from pasta sauces. So theme in our house was obviously update & remodel. We knew this going into this house. The tricky thing was updating in a way that we were happy with but would not price us out of the neighborhood. This is something to consider and be careful of in any house and any neighborhood. Oh this bathroom. The color – faded mustard. 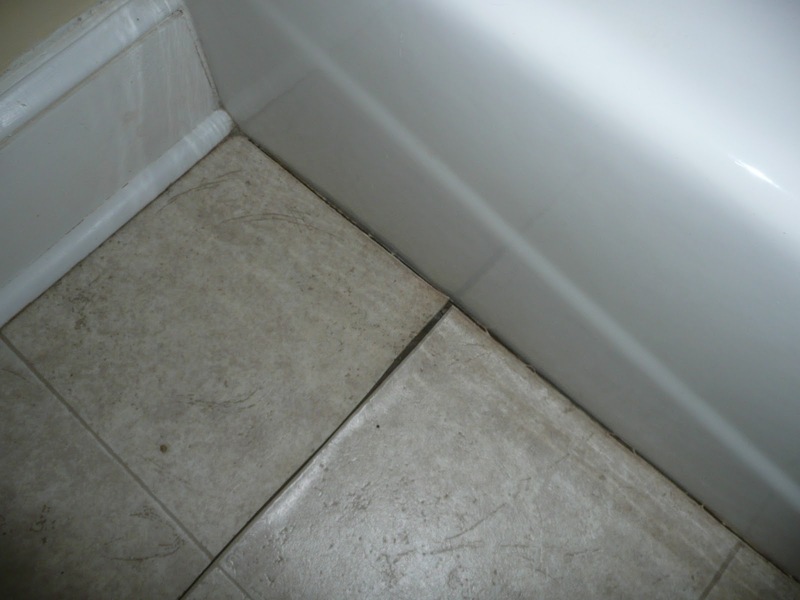 The floor – dirty and peeling along the tub. 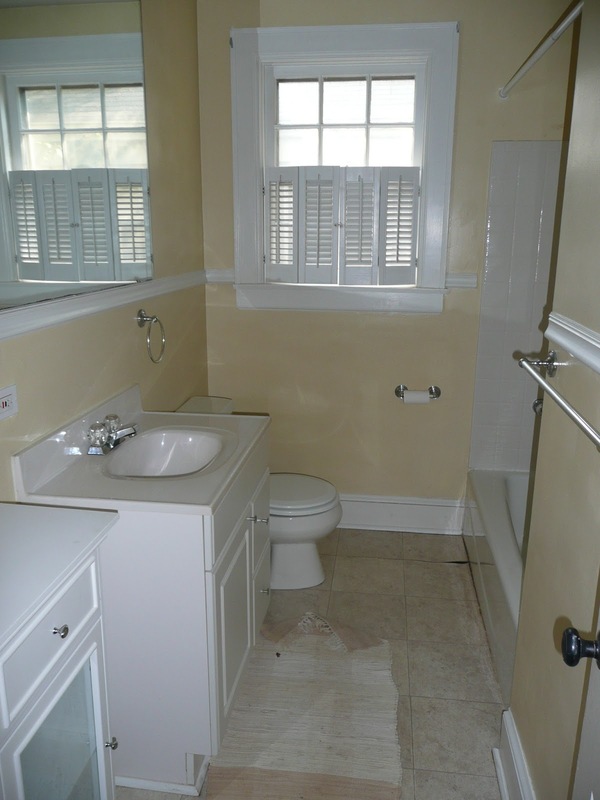 The faucets and lighting – outdated. 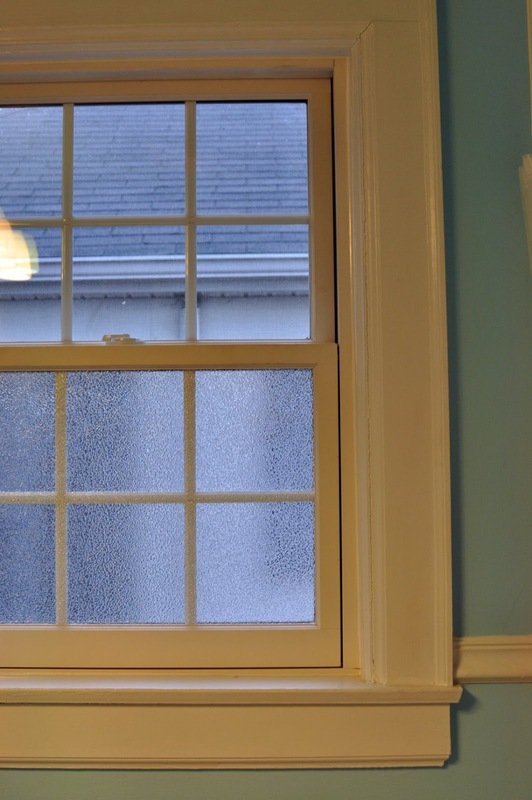 The window covering – dark and ill-fitting. The shower – SCARY. The first thing to go was the floor. 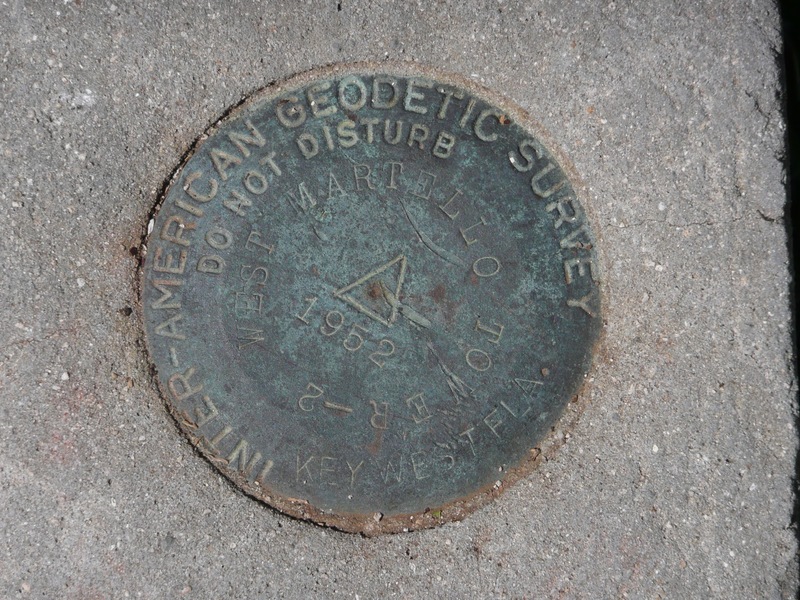 It was replaced before we even moved in – the sub floor had to be replaced as well, due to water damage. Since we have a smaller, older house we opted to replace the toilet with a smaller size. This made the bathroom feel roomier and look larger. 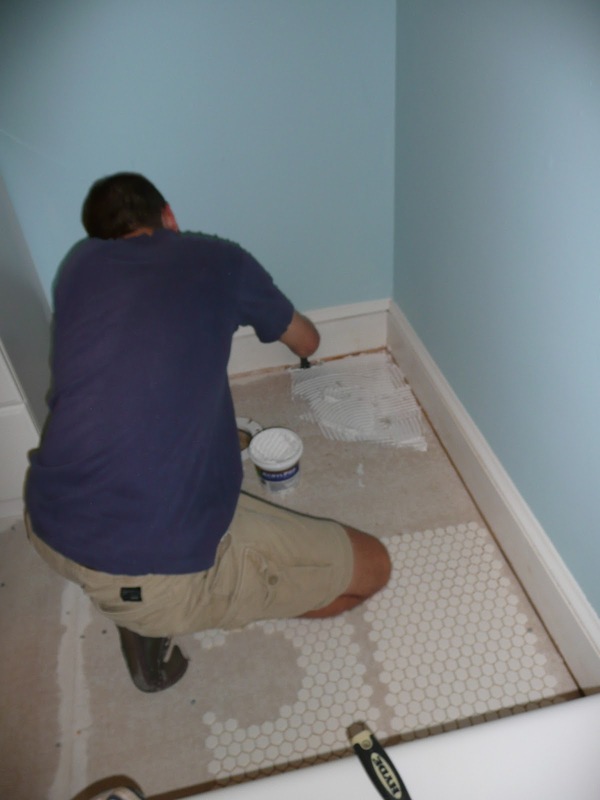 Eric is laying the new tile floor here, before installing the toilet. The floor is an unglazed white ceramic tile. This is the one regret I have. Unglazed white tile soaks up North Carolina red dirt. It forever looks dirty. However, I was told by the employees at the ceramic tile store that it was absolutely stupid to buy glazed tile for a bathroom floor. I wish I had either A. not listened and bought glazed or B. bought unglazed in a different color. Better yet, C. installed bamboo floors like the kitchen. Oh well, live and learn. I have found a few methods to keep this floor clean. The next thing to go was the nasty shower. Luckily, I was not at home the day this came out. Eric said I would have died from an allergy attack or uncontrollable shuddering from mildew. 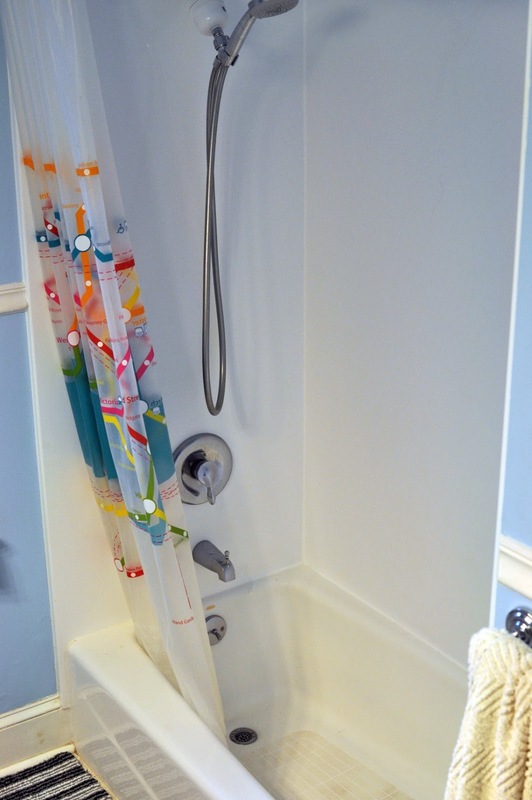 Re-Bath installed this lovely new shower and hauled away the old one. Totally worth it to be able to shower and not worry about it leaking in the wall behind. We replaced all of our windows the following summer. This was also completely worth it – the double pane glass windows made the house quieter and better insulated. The mini shutters had to go and in its place adhesive frosted glass. I was skeptical at first, but Eric was right – it let in light without feeling like your neighbors are staring into your shower. We got rid of the tall, narrow, and awkward storage unit that came with the house. In its place we put a light colored bench from Ikea. 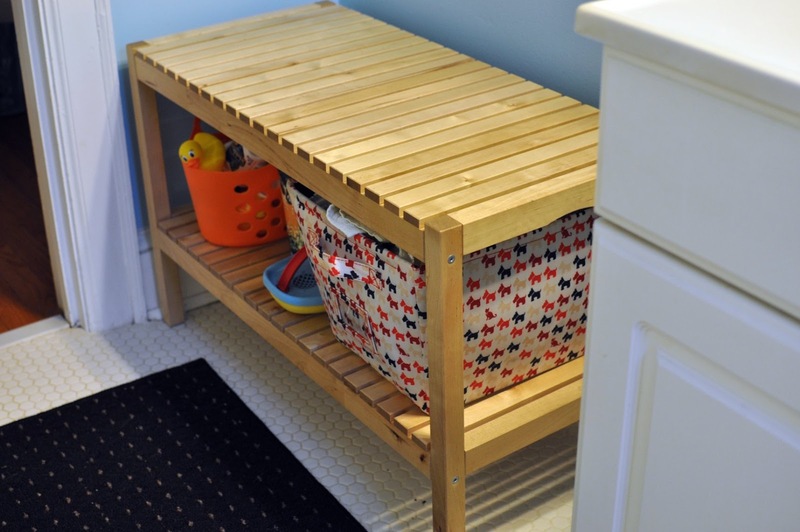 It is perfect for holding extra towels and Greta’s bath toys. Who knew you could now order Ikea products through Amazon?!? Above the toilet we added a train rack for toiletries and the likes. 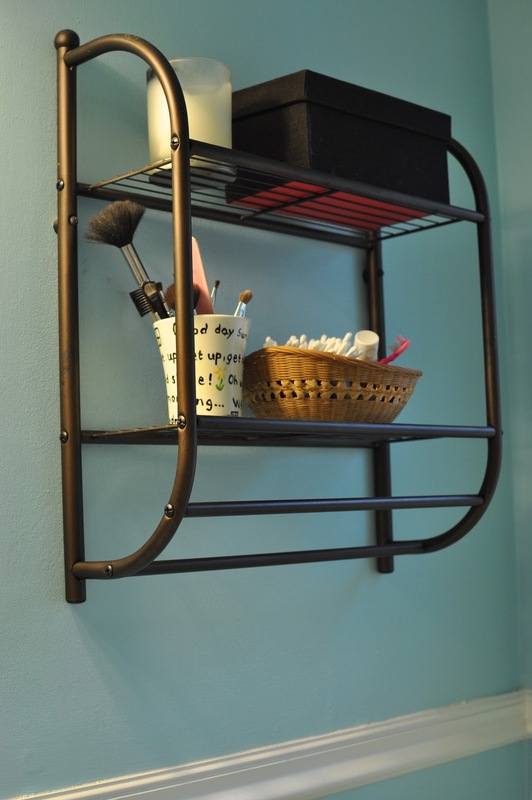 The rubbed oil look was something I have been meaning to coordinate with the rest of the bathroom – towel rack, t.p. holder…. It has yet to come to fruition though. We added some fish artwork for the final touch. 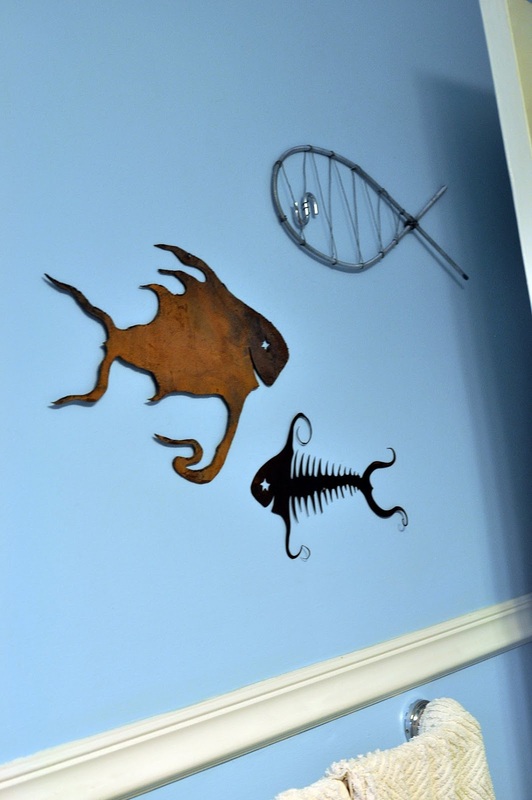 The two fish on the left and bottom are by a local artist in town, Lawrence Feir. The silver one on the top was made by a friend. 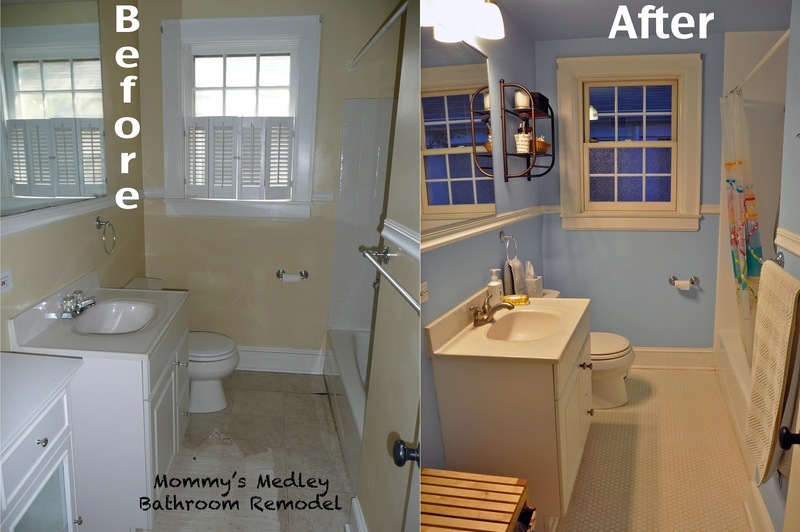 She used simple around the house or hardware store finds. These nuts are crazy! They have a sweet smoky flavor and a crunch and chew that can’t be beat. 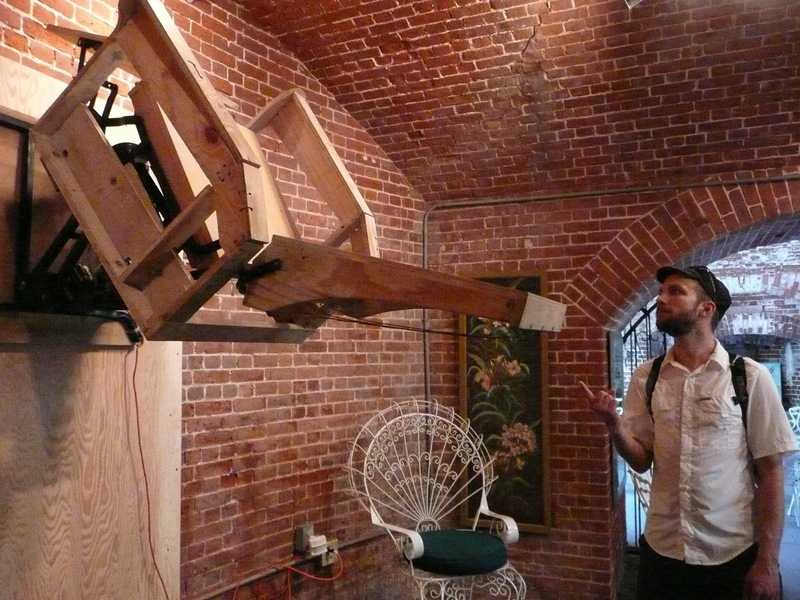 I am a huge fan – Eric is not. 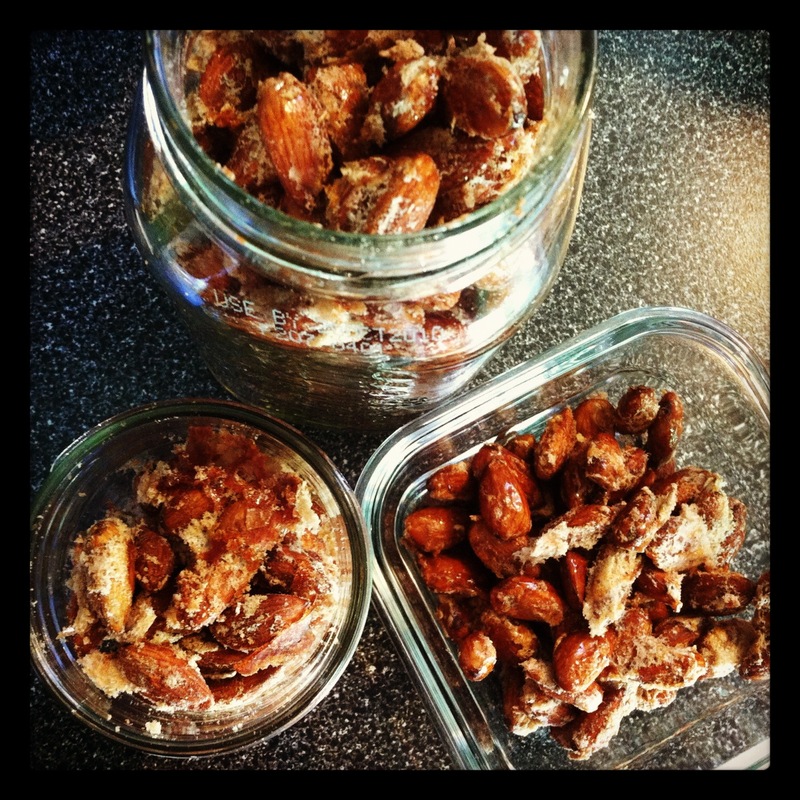 He cannot stand the texture of almonds and I made too many, so if you want any of these nuts, let me know. 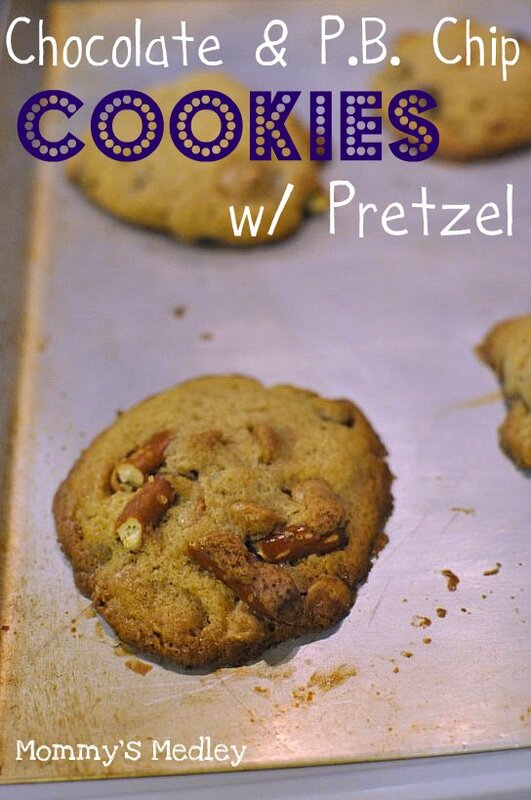 Read on to find out how to make them yourself. These treats were dreamed up due to a Christmas gift from my sister and her husband – a bottle of Ardbeg Scotch. 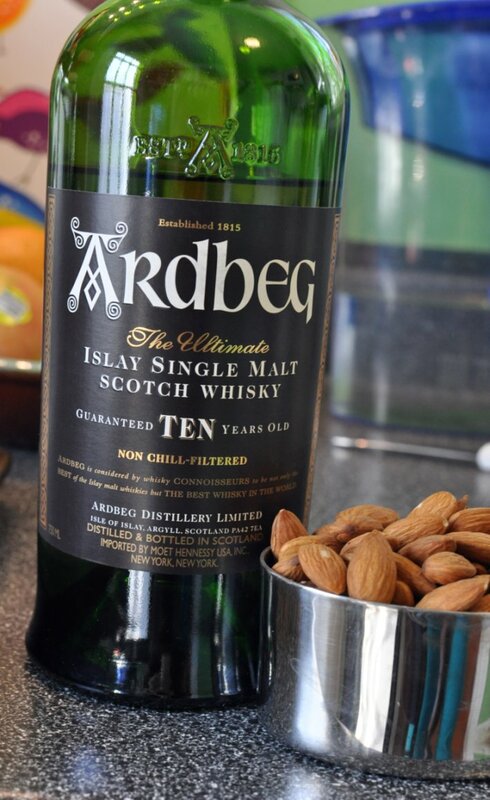 The smokiness of this Scotch complements the maple and almond flavors perfectly. 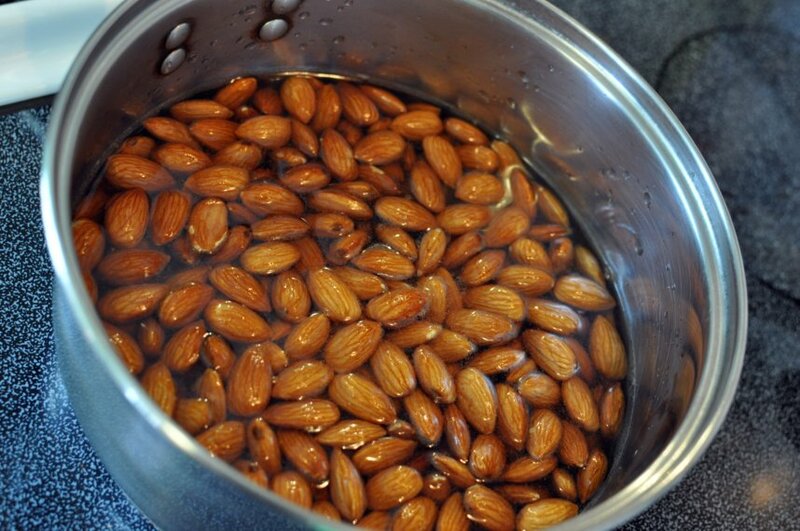 In a medium saucepan, combine 1 c. water, 1/2 c. maple syrup, 1/2 c. Scotch, and 3 c. almonds. Bring to a boil. Turn off heat and allow to soak for 30 minutes. 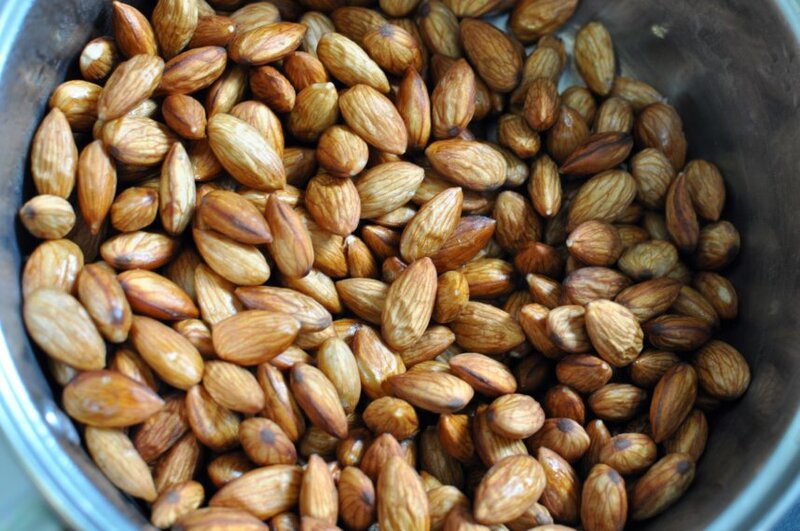 Drain Scotch mixture from almonds into another pan, reserve 2 teaspoons of Scotch mixture in a separate bowl. The almonds will look a little wrinkly, that is how they should look. Return Scotch mixture to a saucepan and bring to boil. 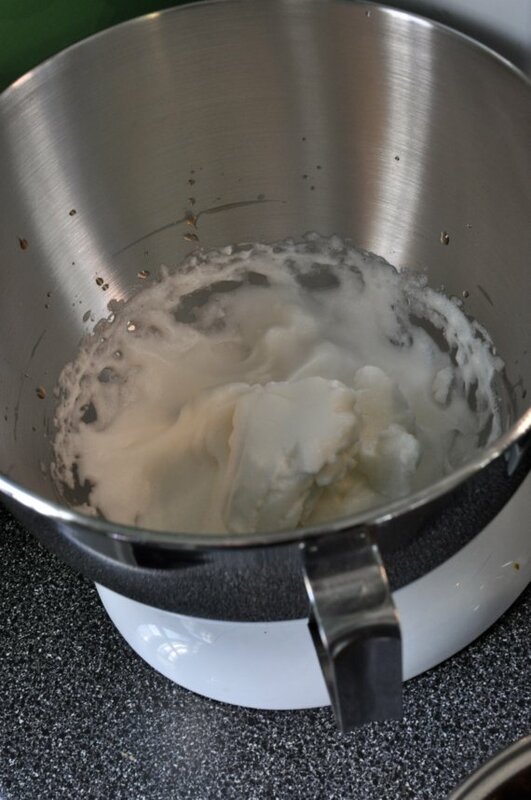 Cook until reduced to less than half of original liquid and thickened – 15 to 20 minutes on low to medium heat. Beat 2 egg whites mixed with reserved 2 teaspoons of Scotch mixture until stiff. Toss almonds in egg whites until covered. 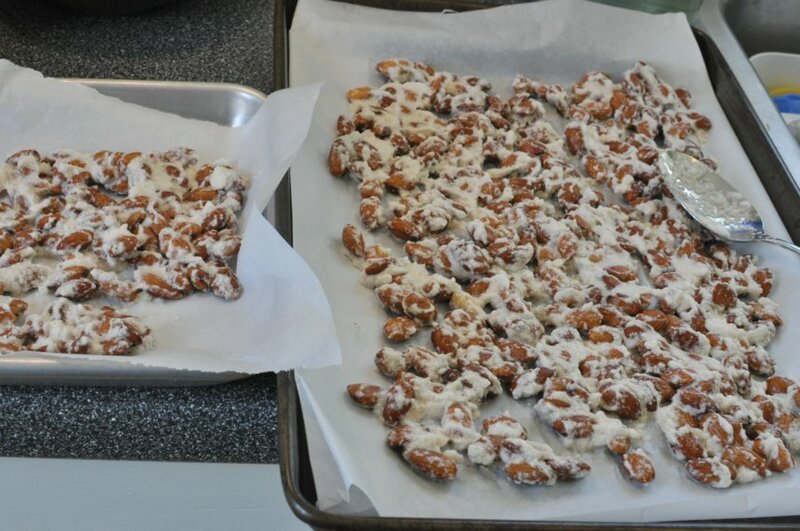 Spread onto rimmed baking sheets lined with parchment paper into a single layer of nuts. Drizzle Scotch syrup over tops of nuts and sprinkle with ground sea salt. Bake in 280 degree oven for 30 to 40 minutes. Allow to cool and place in jars or airtight containers. These nuts would be good as a snack with drinks, a topping on ice cream, or on a simple chocolate cake. The possibilities go on and on! I am off to have a late breakfast – we have a non-mandatory workday today and I am still not feeling healthy. I may stay home and do some grading today. 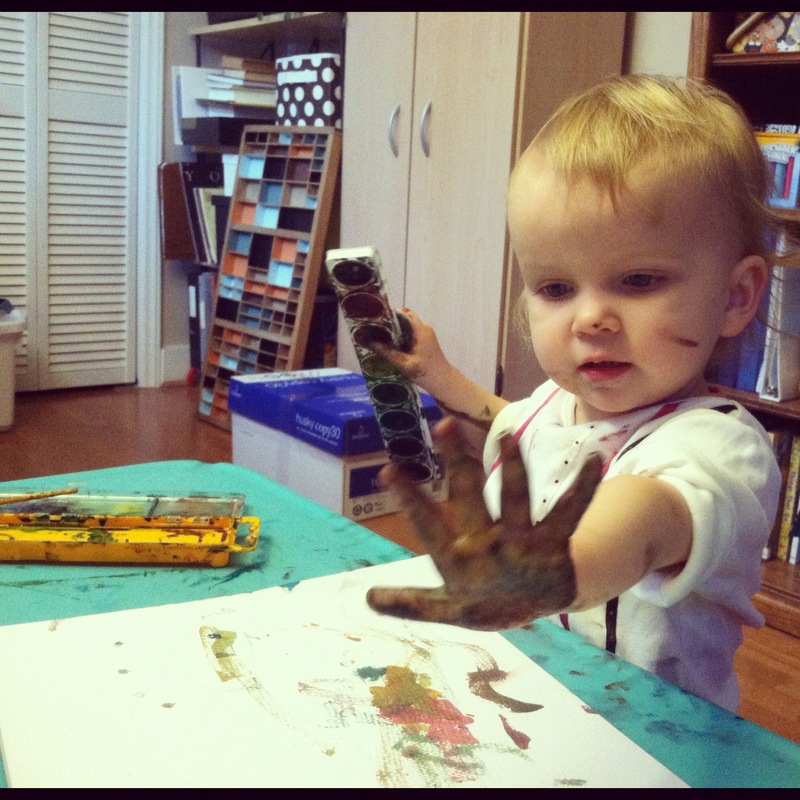 Or, I may enjoy a day of art making with Greta in our nicely organized playroom. 1. 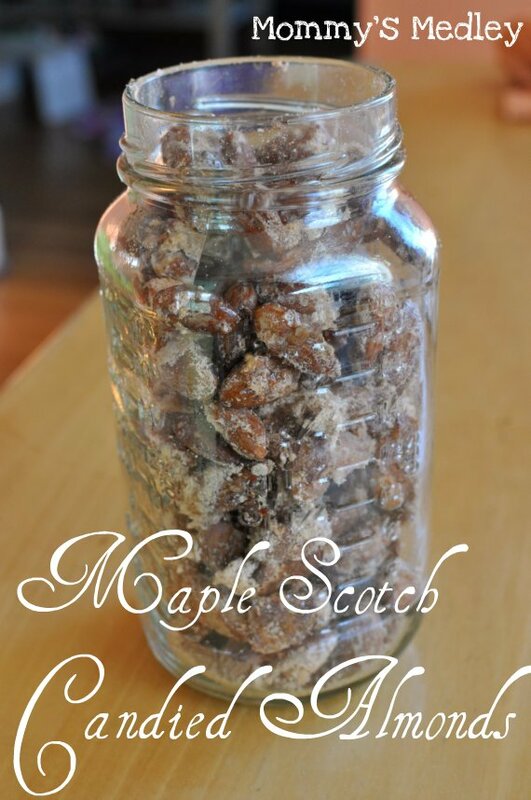 In a medium saucepan, combine 1 c. water, 1/2 c. maple syrup, 1/2 c. Scotch, and 3 c. almonds. Bring to a boil. Turn off heat and allow to soak for 30 minutes. 2. Drain Scotch mixture from almonds into another pan, reserve 2 teaspoons of Scotch mixture in another bowl. Return Scotch mixture to a saucepan and bring to boil. 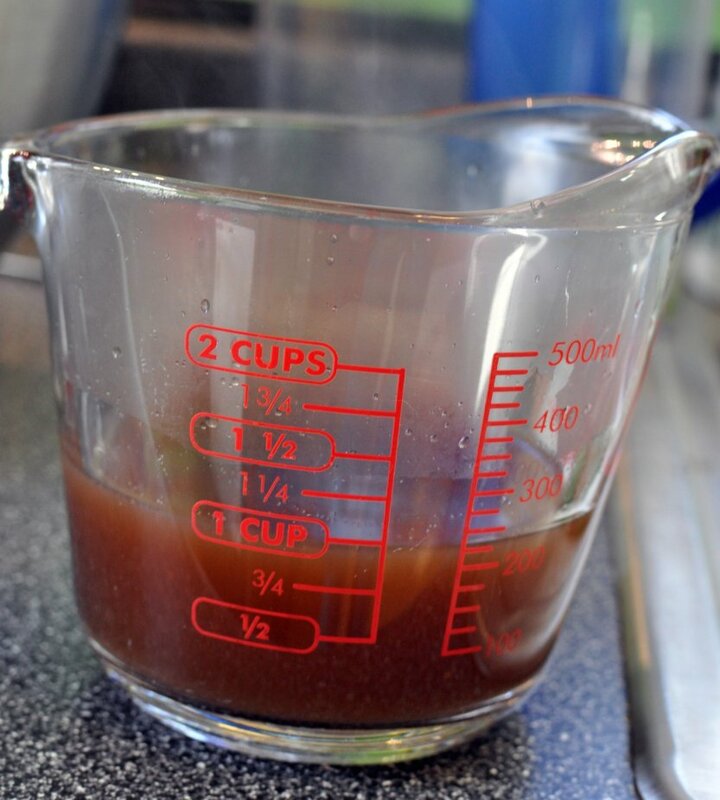 Cook until reduced to less than half of original liquid and thickened – 15 to 20 minutes on low to medium heat. 3. Beat 2 egg whites mixed with reserved 2 teaspoons of Scotch mixture until stiff. Toss almonds in egg whites until covered. 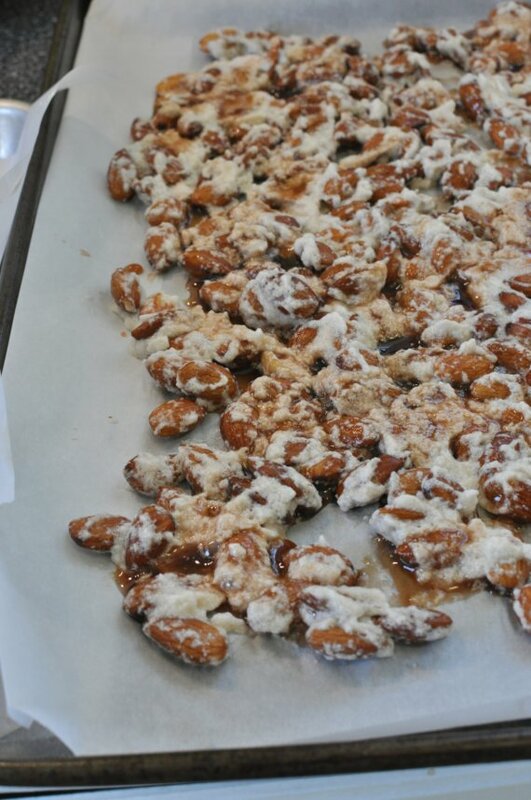 Spread onto rimmed baking sheets lined with parchment paper into a single layer of nuts. Drizzle Scotch syrup over tops of nuts and sprinkle with ground sea salt. Bake in 280 degree oven for 30 to 40 minutes. Allow to cool and place in jars or airtight containers. I just love the satisfaction of before and after photographs. They make the sweat & frustration of a project worthwhile. They are even sweeter when your partner (who is not always on board when it comes to paint) is amazed at the transformation. 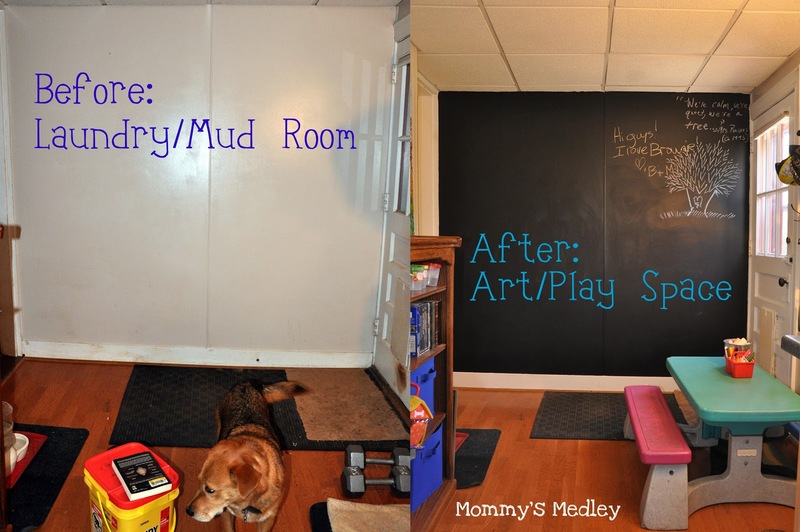 Read on to find out how we turned an under-used, mostly adult space into a kid-friendly family-friendly space. Our house has a back room that is truly a multi-purpose room. This is the room as it was when we bought our house in the summer of 2007. It is a narrow, long room that exits out to our deck in the backyard. 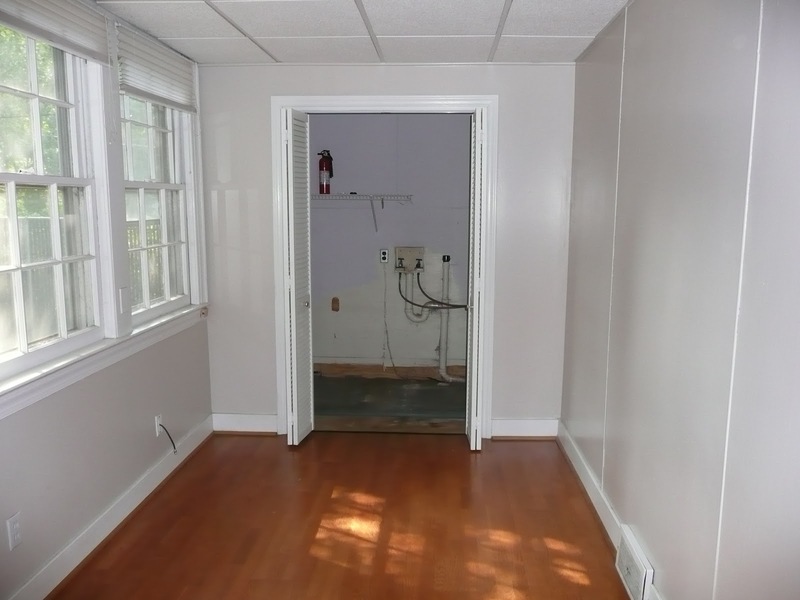 From what we can tell, there used to be a doorway from Greta’s room into this room, the door would have been in the middle of the wall on the right side of this photo. 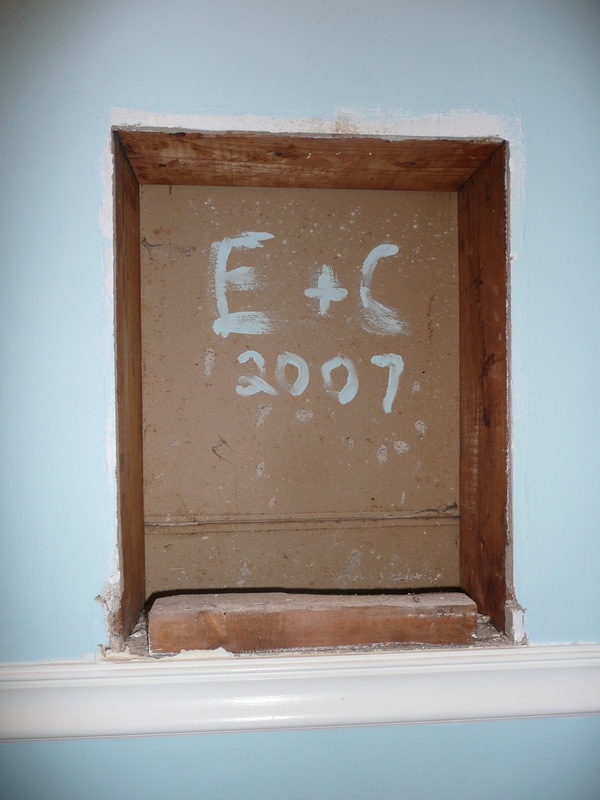 A second chimney is above this closet shown here and there is still brick underneath the flooring of the closet. It makes me wonder if this room were a originally more of a porch. 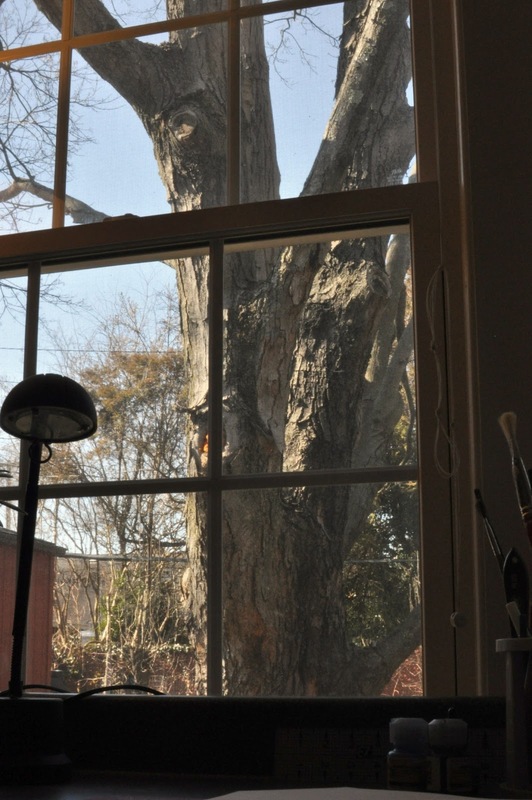 This room has a nice view of the yard and the large maple tree growing just beyond the deck. It gets excellent afternoon sunlight and is truly one of my favorite places to just be. 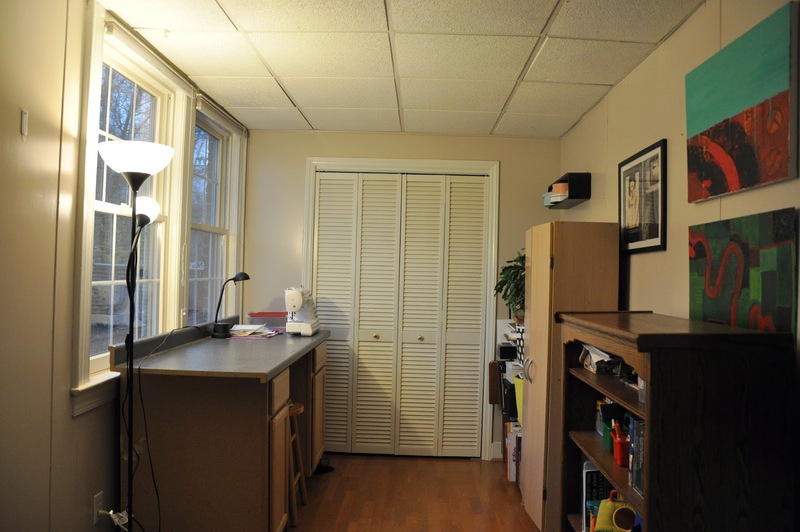 It is also the laundry room. 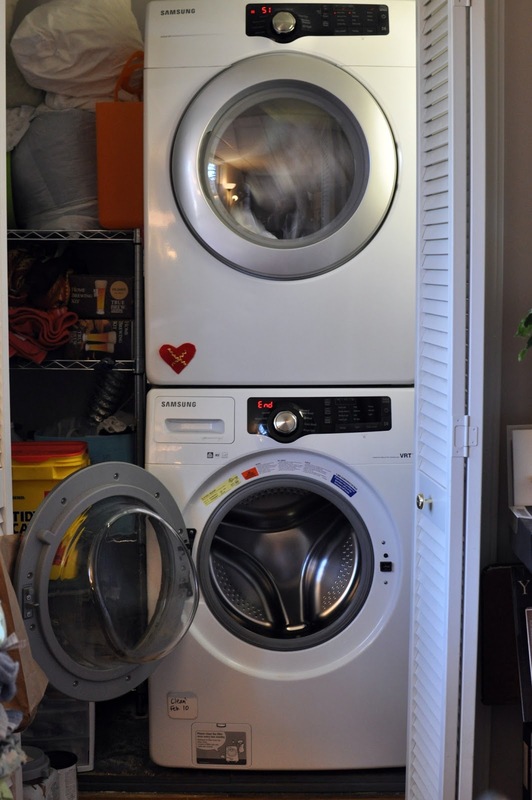 We stacked ours and put a wire shelf in the laundry closet to give us more space. It is my art & sewing room. 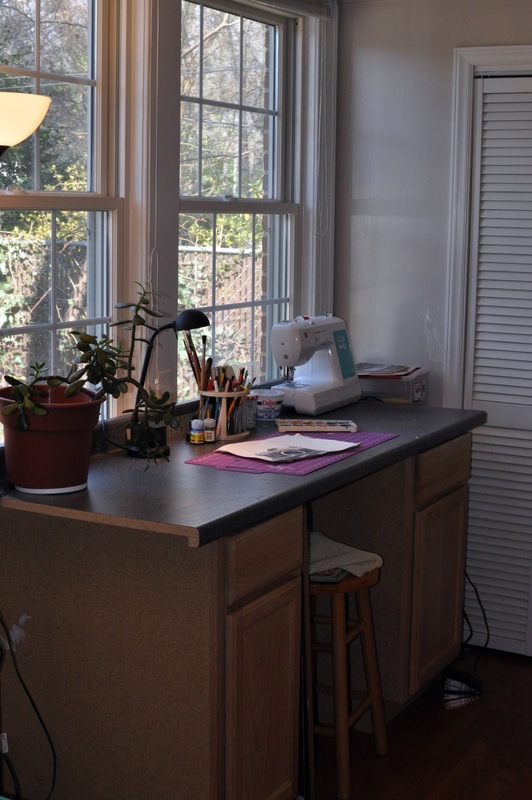 I used the extra counter top from the kitchen remodel and placed it over two plain cabinets as an art table. It is the perfect height to stand or work and roomy enough for my numerous art supplies. 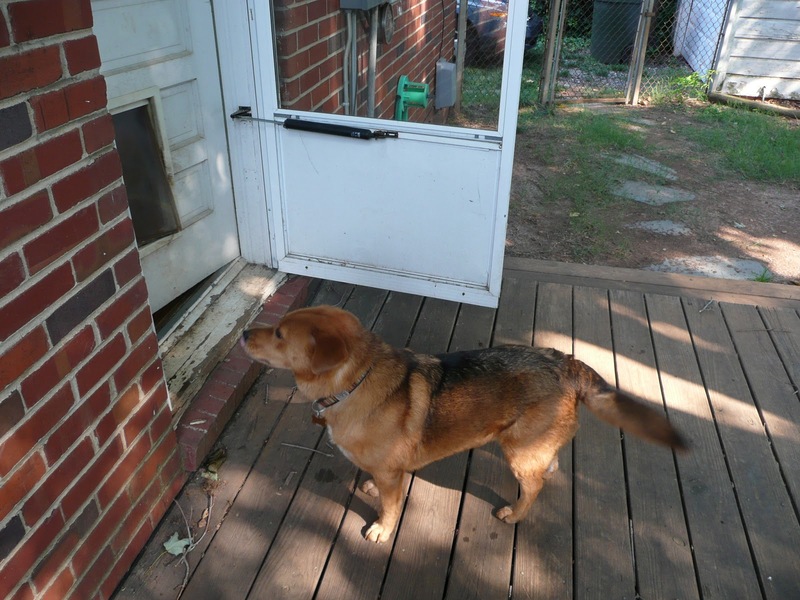 It is Brownie’s access to the backyard – thank goodness for dog doors! 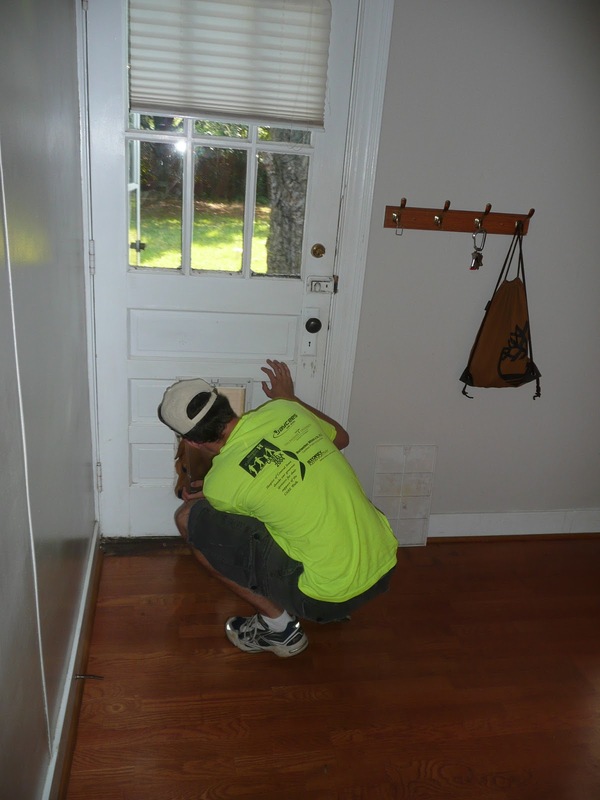 We quickly replaced this screen door with a newer one that also had a dog door. 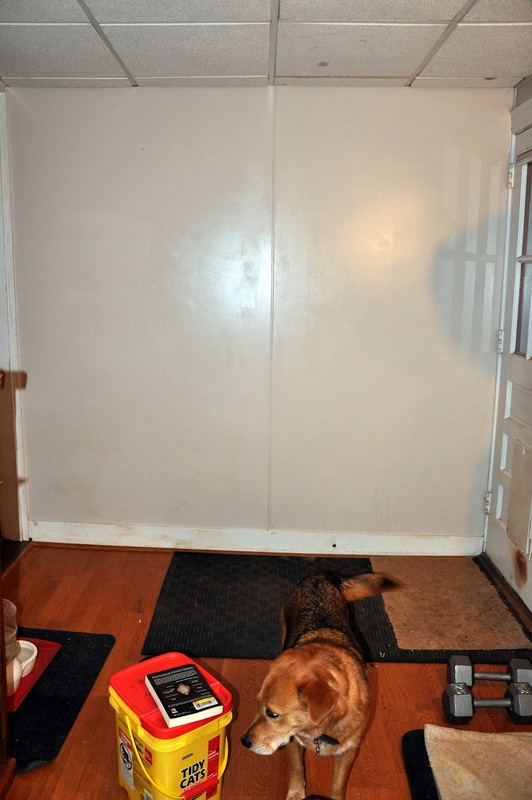 The previous owners just propped open the screen door – hence the thrashed threshold in this photo. The dog door access also this Brownie’s room. There is a door between this room and the rest of the house that we keep closed during the day to keep Brownie and her muddy paws off the couch. It is a perfect setup for an anti-kennel dog. This room makeover took place this past summer, because I decided to make more room for Greta and her artistic endeavors. It’s amazing how having kids shifts your entire life. I always heard people talk about this – but it is never fully realized until it happens to you. So, I moved a lot of my things out – too much clutter hurts creativity anyway – and rearranged Brownie’s things. This is the wall soon to be graced with chalk drawings. Can you see the red North Carolina dirt? That was going to be cleaned and repainted as well. After a deep cleaning, the chalkboard paint went up. Eric had a quick panic moment due to miscommunication. 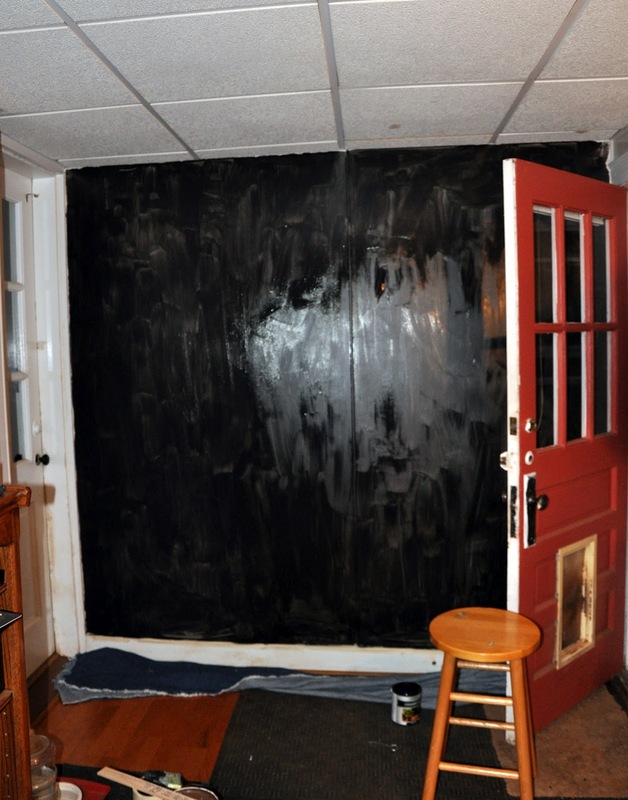 He thought that I was going to paint only a small section of the wall with the chalkboard paint. Oops! I repainted the trim and the insides of both doors with a gloss white. Added bonus: the new gloss paint surface makes cleaning up North Carolina dirt a breeze. 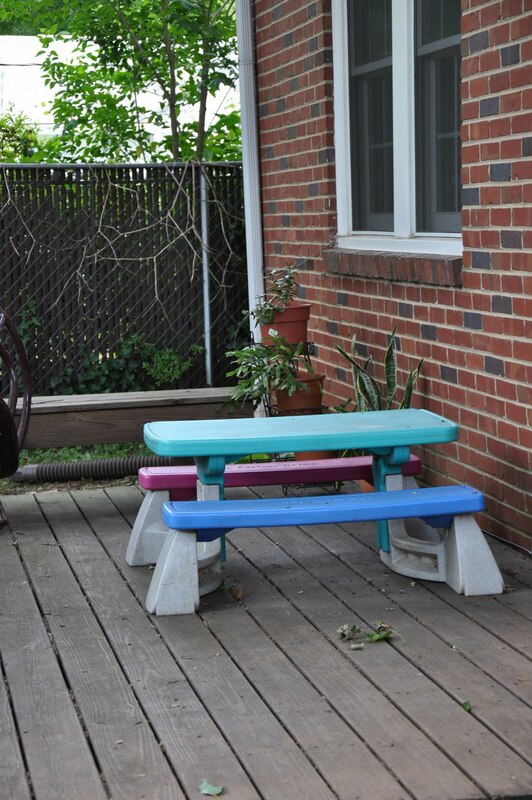 We found a perfectly good picnic table at the curb(!) on trash day and brought it home. Once we cleaned it up, we realized it was perfect for Greta’s art room. 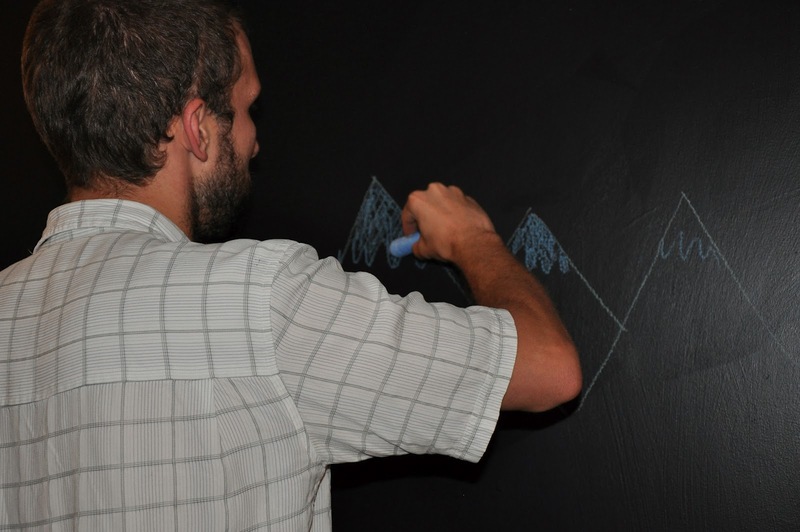 I love that the skeptic was the first to draw on the new chalkboard wall. These days, Greta enjoys making her dots and lines on the chalkboard wall, though dumping the chalk and putting them back in the bucket is usually more fun. Still, it’s a fun space now that our friends and their children alike enjoy writing or drawing on when they come to visit. One end of this room is still my art and sewing room, laundry room, and art supply storage area and the other end belongs to Greta. I enjoy this room even more now that Greta and the rest of my family are more likely to visit. We emptied the bookcase behind the picnic art table and it filled it with Greta’s books, art supplies, and a few larger size toys. She loves that she can walk back to this room and sit on furniture that is at her scale. I feel lucky to have had a space that was as versatile as this – it is now a much more enjoyable room for all of us. There is even still room for Brownie to hang out. 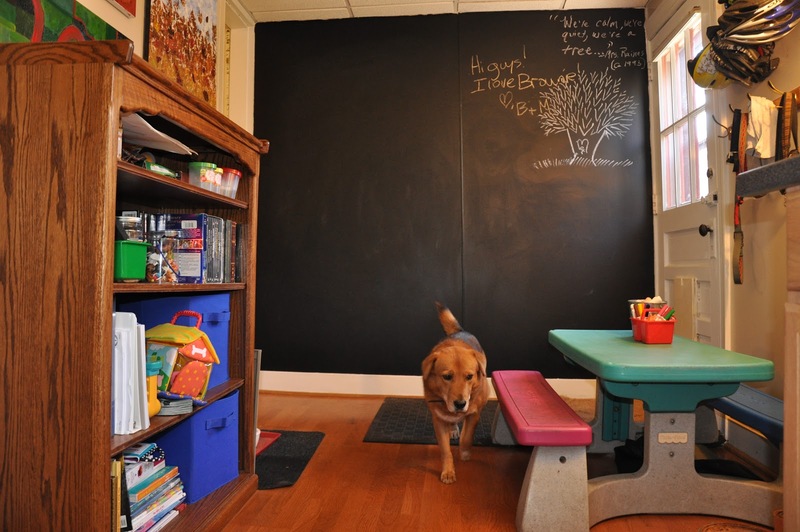 These could be a fun alternative to chalkboard paint – less of a commitment, that’s for sure! I mixed the cake up in a medium mixing bowl. Normally for this recipe, you mix everything in the pan, but since I was using a layer of cherries on the bottom, a bowl was necessary. 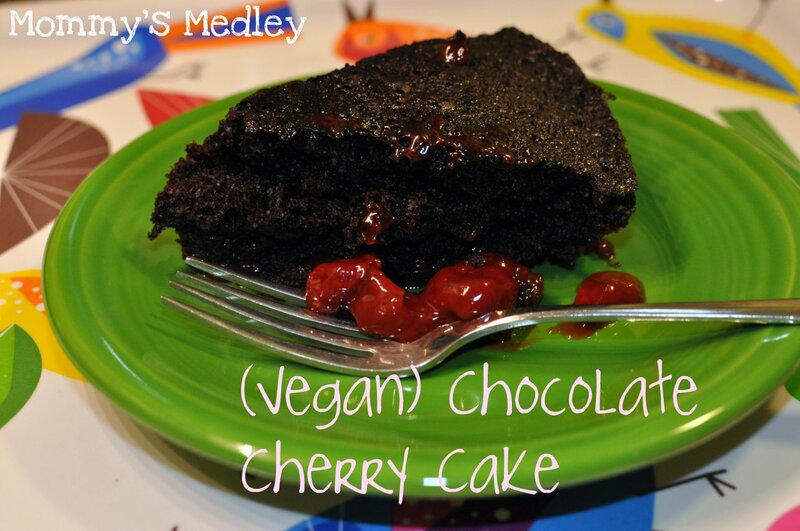 I made the same vegan cake I made for the Super Bowl last year, but added a twist with a layer of cherries on the bottom of the cake. Of course, I made the horrible mistake of reading the ingredients! I think next time I will go with frozen or fresh cherries and a sprinkling of sugar and melted butter or margarine. 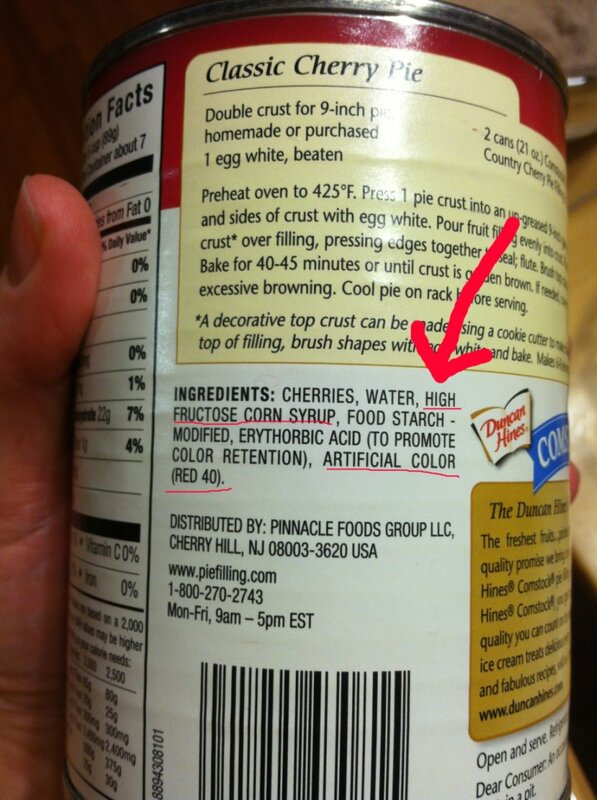 No more corn syrup and Red 40 for me. 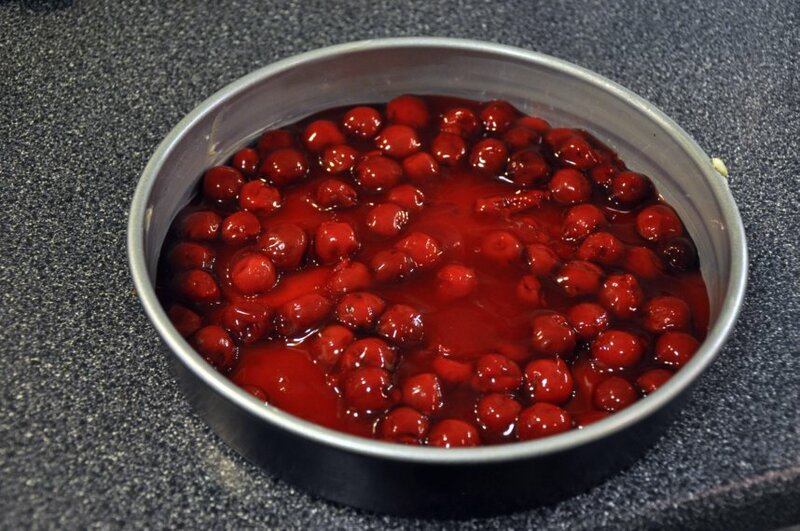 Grease a 9-inch cake pan with margarine and then pour the can of cherries on the bottom of the pan. That Red 40 sure does look festive and Valentine-like though! Happy Valentine’s Day to you, Eric! 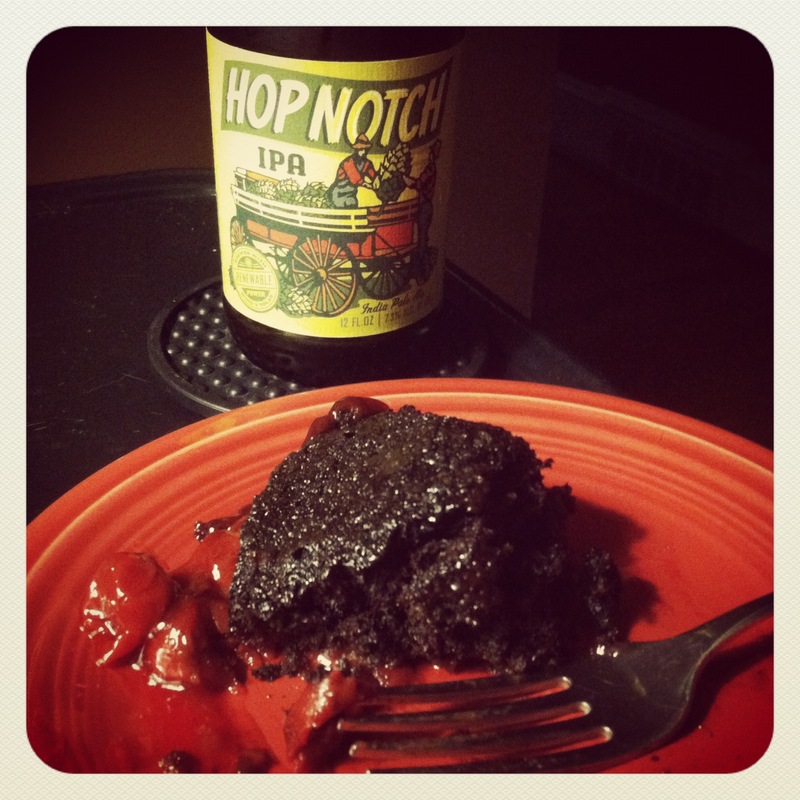 He got to enjoy his cake with an IPA. Eric and I always opt to stay home on Valentine’s Day, we are curmudgeons that way – it is just too busy in the restaurants, the wait staff is annoyed, and the “specials” are over priced. We plan on staying in and making dinner tonight. What are your plans? 1. Preheat oven to 350. Grease a 9-inch cake pan. 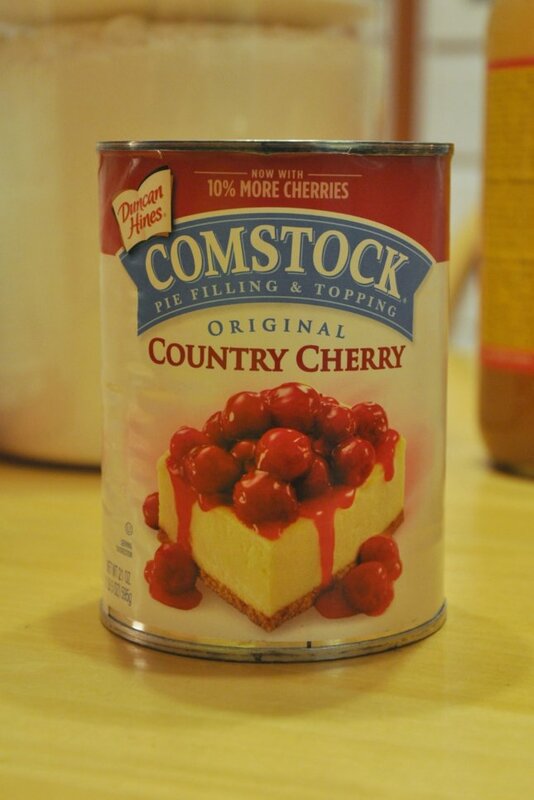 Open can of cherries, pour into bottom and smooth out. In a medium mixing bowl, mix flour, sugar, cocoa, baking soda, and salt with fork. Mix very well. 2. Mix water, vanilla, oil, and vinegar in a small bowl or glass mixing cup. Add all at once to the dry ingredients. Mix well. Use a spatula to scrape sides and bottoms to ensure adequate mixing. Pour cake batter over the cherry mixture. 3. Bake 30 to 40 minutes or til knife comes out clean. I’m back with more handmade Valentine’s card ideas. 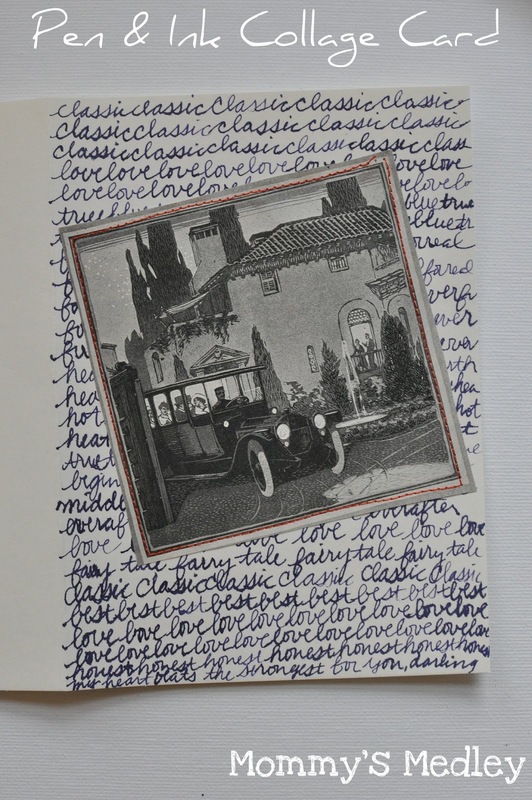 This time, I mixed things up a bit and used pen and ink as the background to my old advertising book collage. I love the classic car in this image. The Iowa collage is for an Iowa transplant friend here in Greensboro. 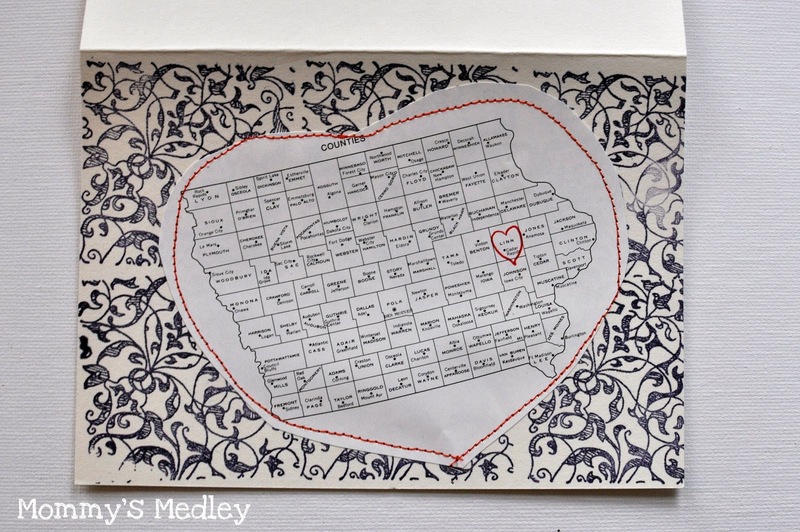 I saved a couple books from library discard on Iowa and have been using them for art projects. 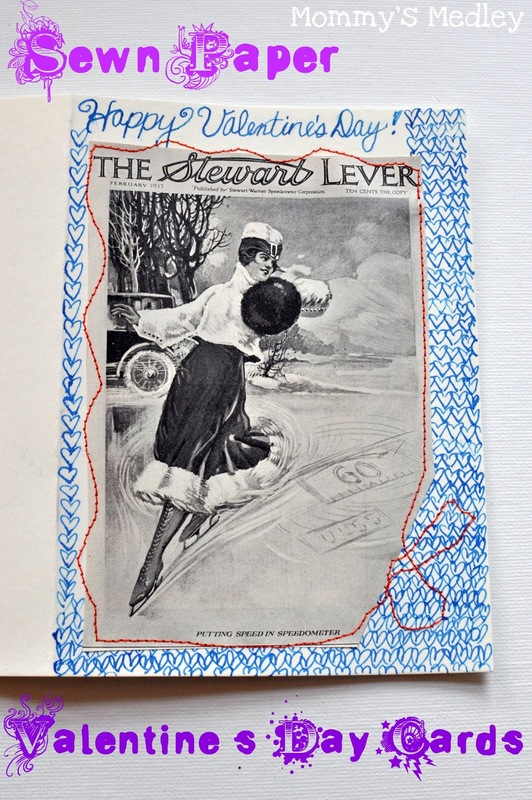 The background on this card is made from rubber stamps. For this card, I went out on a limb. I decided to take a more abstract approach. 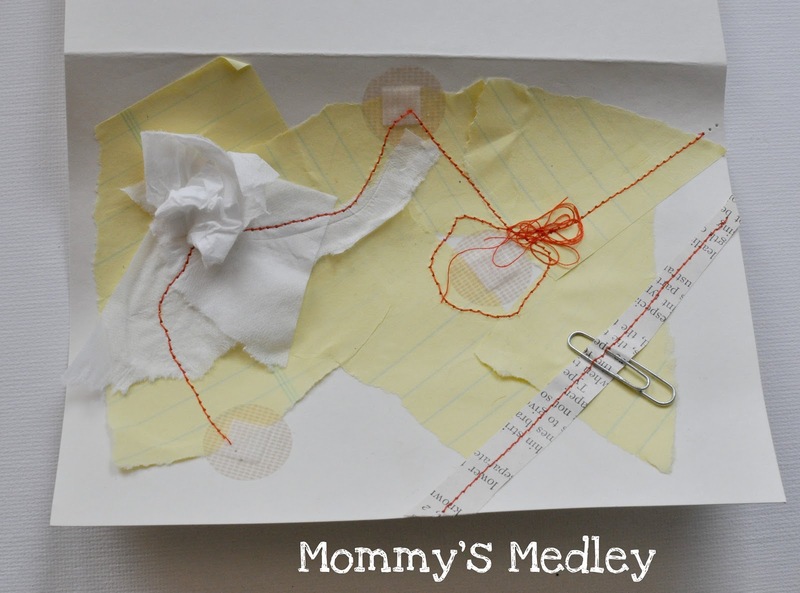 This card is the practical card for teachers – tissue, bandages, paperclips, and paper. Tune in tomorrow for the rest of the Valentine Day cards from 2013. Enjoy your evening, y’all!